HVRN Talk Radio Network, with host Todd Bates, will be hosting another great Midnight Syndicate Weekend. The event kicks off today at 5:00 p.m. Eastern and runs until midnight. It continues on Sunday at 5:00 p.m. Eastern. Edward Douglas and Gavin Goszka will be doing a live interview on Sunday starting at 9:00 p.m. Eastern. Tune in for music and giveaways all weekend long. Want a look inside the Transworld Haunted House Show? Robert Kurtzman’s Creature Corps just released the second of two episodes featuring their experiences at the show. Featuring footage from The Darkness haunted house and music from Midnight Syndicate. Watch Episode 1 or Episode 2. Sean Plummer of Rue Morgue Magazine sat down with Edward Douglas to ask him about The Dead Matter and future plans for Midnight Syndicate. Read the interview here. Edward Douglas will be screening The Dead Matter at HauntCon in Louisville, KY on April 29th and at the Thursday Night Meet-N-Greet at National Haunters Convention in King of Prussia, PA on May 5th. For more information on these and other screenings, visit The Dead Matter SCREENINGS page. Drive In of the Dead has just posted an interview with Destini Beard. In it, she talks about last year’s Dark Masquerade EP collaboration with Midnight Syndicate, as well as her future plans including talk of a new CD! To read the interview, click on the SNACK BAR button, and then the SNACK BAR MENU to reveal the INTERVIEWS section, which also features an earlier interview with Edward Douglas. A fun site to explore! When Carnival Arcane comes to town this August, fans of Dead Matter will hear some familiar voices. Actors Brian Van Camp and Jason Carter will both be appearing on the upcoming Midnight Syndicate CD. “They both really added to the whole experience,” said Edward Douglas. “Not that you could know it from watching the movie, but Brian (Van Camp) has a great baritone voice.” Carter’s recent voiceover work includes the Lord of the Rings: Battle for Middle Earth series of video games. Join Midnight Syndicate’s Gavin Goszka and Edward Douglas live tonight on Sacred Division with Bishop Long. The interview starts at 8:00pm Eastern. To listen live, go to www.fateradio.com. We’ve just posted a new batch of reviews for The Dead Matter, including one for the soundtrack from Radio Casbah. To read the reviews, click here or the link below. 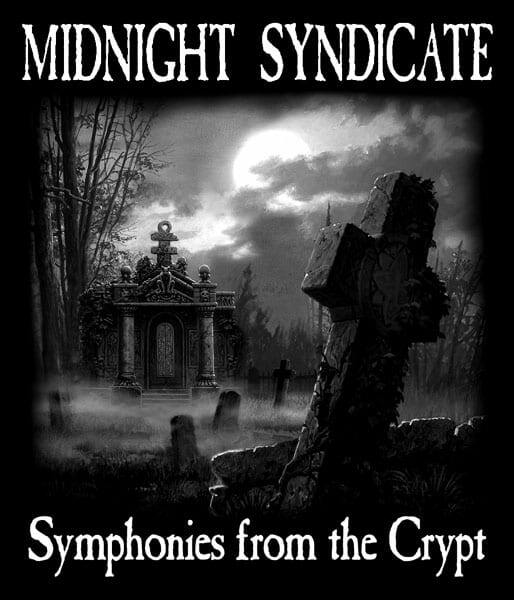 Two classic Midnight Syndicate t-shirts, The 13th Hour and Symphonies from the Crypt, are back in stock. The shirts are available in sizes SMALL through XXXL. While supplies last! Edward Douglas talked to Michael Gingold of Fangoria about the upcoming Carnival Arcane CD and plans for the future in a news article posted earlier this week. 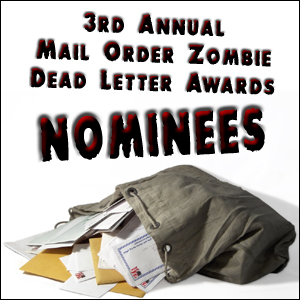 Vote for The Dead Matter in this year’s Mail Order Zombie Dead Letter Awards! The Dead Matter has been nominated in several categories for this year’s Mail Order Zombie Dead Letter Awards including: Best Score in a Zombie Film (Edward Douglas/Midnight Syndicate), Best Screenplay in a Zombie Film (Edward Douglas/Tony Demci), Best Special FX Makeup (David Greathouse/Robert Kurtzman’s Creature Crew), Best Zombie (Brian Van Camp as “Mark”), and Best Cameo (Richard Dyszel “Count Gore de Vol” as “The Teacher” in the classroom scene). You can vote now by clicking here! As we posted last week, The Dead Matter was also nominated for BEST INDIE FILM in the prestigious Rondo Awards. If you haven’t voted for it yet, you can do so at www.rondoaward.com! Vote for The Dead Matter in the Rondo Awards! The Dead Matter has been nominated for BEST INDEPENDENT HORROR FILM category in this year’s Rondo Awards and we need your support! To vote for the movie simply follow this link. You do NOT have to vote in every category. The Rondo Awards are a great honor in the horror community and we appreciate your taking time to support Midnight Syndicate and The Dead Matter team! The circus is coming to town… Midnight Syndicate is in the studio working on a new CD entitled Carnival Arcane, with an anticipated release date in early August 2011. Photo credit. Sin de la Morte covers all the aspects of Midnight Syndicate’s career in this new interview with Edward Douglas just posted on Horror Addicts. Click here to check it out. Bloody-Disgusting reviewer and podcast host Keenan “Horror Guy” McClelland gave The Dead Matter his vote on the site’s annual Top 10 Horror Films of 2010 segment. Click here to see his complete list. For other recent reviews and interviews, click here. Chatanooga’s Con Nooga will be home to the first Dead Matter event of 2011 and will feature a screening as well as a Q&A panel with Edward Douglas, Jason Carter, and Brian Van Camp. All three of them will also be on-hand at the Midnight Syndicate booth throughout the convention, selling and signing Midnight Syndicate and The Dead Matter DVDs and merchandise. Edward Douglas will also be hosting a Midnight Syndicate Panel (time and date TBD). Other panels will be announced later. Click here for more Dead Matter screenings. Drive-In of the Dead has just posted a brand new interview with Edward Douglas. 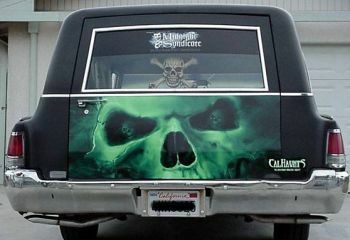 To check it out, visit www.driveinofthedead.com, click on the Snack Bar button, and then the Snack Bar Menu button to get to the Interviews Page. Be sure to check out the new Weekly Scream Queen, CB Spencer! Catch a live interview tonight with Gavin Goszka on Haunted Voices Radio. The interview will start at 9:00pm Eastern. Tune in for the latest news and CD giveaways. The staff at Drive-In of the Dead give The Dead Matter some serious love! The guys at Drive-In of the Dead are fans of Midnight Syndicate – but admitted to us they were unsure how it would translate to film. What was their verdict? If you haven’t stopped by the Drive-in yet, you’re in for a real treat. 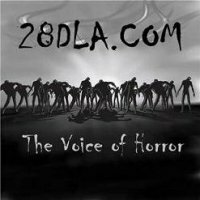 A unique, well-crafted horror site. Be sure to swing by the Snack Bar and check out the Scream Queen of the Week! We would like to thank our fans for helping to make our 13th Anniversary our best year ever! We’re working on a lot of new things for 2011, including a new Midnight Syndicate CD coming in August. From our families and us, to you and yours, have a safe and wonderful holiday season! Check out a new interview with Edward Douglas on Mr. Fright’s Five With Frights segment where he talks about the origins of The Dead Matter and fields a few unique questions. The horror writers at Benevolent Street have just given The Dead Matter an excellent review citing strong sound, music, production values for an indie film, and story. We’ve just posted some never-before-seen photos from Midnight Syndicate’s The 13th Hour CD Release Party on Facebook for your viewing pleasure. Midnight Syndicate is planning another CD Release Party in 2011. Details coming soon! Fan of paranormal shows? Looking for a laugh? 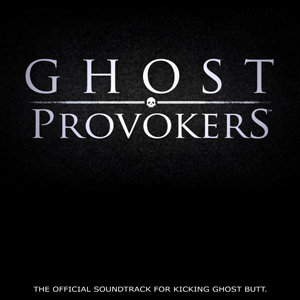 Click here and check out the newest 3-part installment of Ghost Provokers featuring music from Midnight Syndicate and a cameo from a familiar face at end of Part 1 of 3. Filmed on board the Queen Mary at this year’s Ghost Fest Expo 4, this spooktacular parody hit the scene earlier this year with their first episode Wildewood Manor. 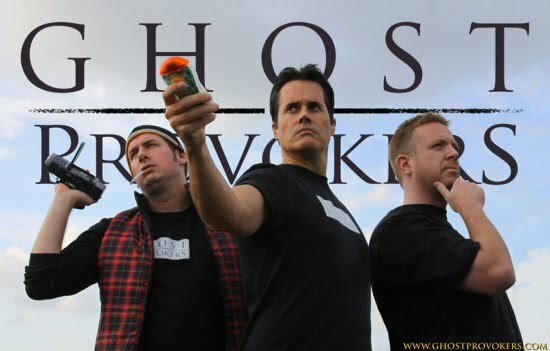 To see that episode and more be sure to check out the official Ghost Provokers website! Best-Horror-Movies.com is giving you a chance to win a copy of The Dead Matter. For more details, click here. While you are there, be sure to check out a great review for the movie here. The Dead Matter has just received a great review from the writers at Xomba’s new Horror Channel. Check it out here. The Dead Matter is still available here and at Hot Topic stores. It makes the perfect stocking stuffer! Famous Monsters of Filmland interviews Edward Douglas and gives The Dead Matter thumbs up! 2010 brought us the return of one of the most beloved horror magazines of all time, Famous Monsters of Filmland. This venerable publication also has a new website where you can check out an interview with Edward Douglas, along with another great review of The Dead Matter (small spoiler alert). The article is written by Max Cheney of the Rondo Award-winning horror blog, Drunken Severed Head. Check out a 2-part interview with Ed and Gavin on Sci-Fi Bookshelf. Click here for Part 1 and here for Part 2. Dead Matter screenings in Minneapolis and Lexington THIS WEEKEND! ScareFest (Lexington, KY) – This great event features a mix of both horror guests (including George Romero! 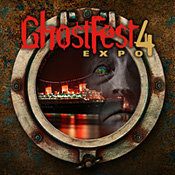 ), panels, and screenings, as well as paranormal guests, panels, and ghost tours. The Dead Matter screening will be held on Friday at 8pm with a Q&A to follow. Director Edward Douglas and actor Brian Van Camp (Mark, the Zombie) will be at the screening and on-hand in the Exhibit Hall all three days. 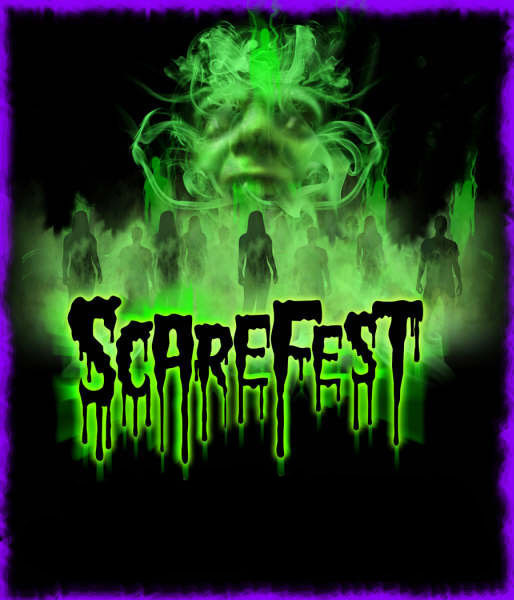 Click here for more info on ScareFest. 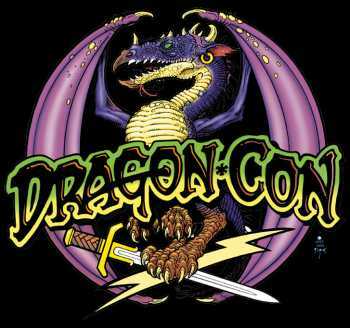 Crypticon (Bloomington, MN) – Jeffrey Combs (Re-Animator) and musical guests Mushroomhead round out this horror con’s 5th installment. Meet actress Jen Sharlow at The Dead Matter screening on Saturday at 8pm, as well as in the Vendor Room all three days of the con. Click here for more details on Crypticon Minneapolis. 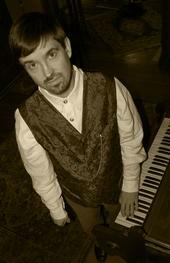 Midnight Syndicate’s Edward Douglas will be live tonight on The Buzz with Scotty Rorek and Zita Ost. The segment starts at 11:45pm Eastern. To listen live, go to The Buzz on Talk Stream Live. The call-in number for the show is 262-672-2488. Gail Z. Martin, author of the dark fiction series Chronicles of Necromancer, has launched her 2010 Days of the Dead Blog Tour. The tour features interviews, book excerpts, and contests. You can win a copy of her book Dark Haven, along with a Midnight Syndicate CD. Simply send an email to contests@midnightsyndicate.com with your name and snail mail address between now and November 1st, 2010 at noon Eastern. Six winners will be chosen randomly on the 1st. Listen to Midnight Syndicate now on Sirius/XM’s ‘Scream’ Halloween Radio (Sirius Ch. 113, XM Ch. 227). This features an entertaining mix of Midnight Syndicate music, Halloween tales, celebrity interviews, audio clips from classic horror films, and sound effects. Midnight Syndicate and Taylor Swift? – Check out a new video just uploaded to ShockHound featuring Taylor, Black Veil Brides, Underoath and others sharing their best and worst Halloween stories. All set to the music of Midnight Syndicate, of course. Check out a fun new interview with Edward Douglas on Wired.com where he talks about Halloween, Midnight Syndicate, and the making of The Dead Matter. We’ve just posted Eternal Legacy‘s music video to their song, The Dead Matter, here and on YouTube. Directed by Joe Fortunato and produced by Bill Peters (Auburn Records), the video showcases clips from The Dead Matter movie and appears as an extra on The Dead Matter DVD. The song is also featured on the Original Motion Picture Soundtrack CD. Just one more great reason to pick up the The Dead Matter: 3-Disc Deluxe Edition here and at Hot Topic this month! Another great Dead Matter event for Northeast Ohio is this weekend. Meet Producer Gary Jones and actors Jason Carter, “Big Chuck” Schodowski, Donna Williams, Christina Capadona, Brian Van Camp, Mike Olszewksi, and Al Tuskes at Ghoulardifest 2010. Join the cast for a screening of The Dead Matter Saturday at 4pm. Immediately following the screening, there will be a Q&A session led by Gary Jones. Afterwards, hang out with the cast at the Ghoulardifest Halloween Party from 8pm till 11:30pm (extra admission charge – see website). “Big Chuck” Schodowski and the cast members will be on-hand at the Midnight Syndicate booth Saturday (starting at 12 noon) and on Sunday. This is the perfect time to pick up a copy of the DVD, t-shirt, and poster and/or have your stuff signed! For more Dead Matter screenings and events, visit our SCREENINGS page. In October of 2007, Edward and Gavin starred as comic book characters in The Asylumantics’ Phantom Music Box. To celebrate the 10th Anniversary of The Asylumantics (just in time for Halloween) artist Chris Cantrell has re-released the issue. For more information, click here. Midnight Syndicate will be in Morgantown, West Virginia THIS SATURDAY for a signing, screening, and Q&A. From 2pm to 4pm, Ed and Gavin will be signing CDs, DVDs, and giving away Dead Matter movie posters at The Illusive Skull Costume Castle in the Morgantown Mall Commons. Afterwards, they will be making an appearance at Morgantown’s Annual Zombie Walk (registration opens at 7pm, starts at 8pm). After the Walk, you can join Ed, Gavin, and the zombie horde at Billiards & Cue where there will be a 9pm screening of The Dead Matter with Q&A immediately following. Admission to the screening is $5. 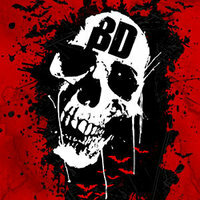 For more details and other Dead Matter events, click here. 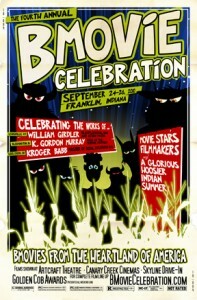 A GREAT event for horror fans in Ohio! 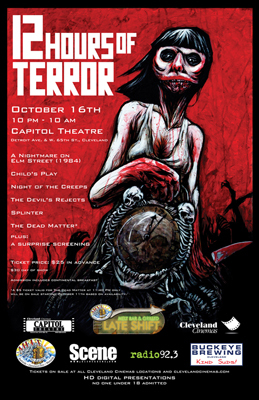 Co-sponsored by Buckeye Brewing and Cleveland Cinemas, this 12-hour horror marathon at the Capitol Theatre includes screenings of the 1984 version of Nightmare on Elm Street, Child’s Play, Night of the Creeps, Devil’s Rejects (featuring FX by Robert Kurtzman’s Creature Corps), Splinter, The Dead Matter, and a special SURPRISE MYSTERY SCREENING of a cult classic. The Dead Matter is the 2nd film of the night and will start at 11:40pm. Admission is $25 and covers all 7 films. $5 tickets for JUST The Dead Matter are also available. To purchase advance tickets, click here. The newly-renovated Capitol Theatre will have an excellent supply of Buckeye Beer (featured in The Dead Matter along with Thirsty Dog out of Akron, OH) throughout the event. For more Dead Matter events, click here. 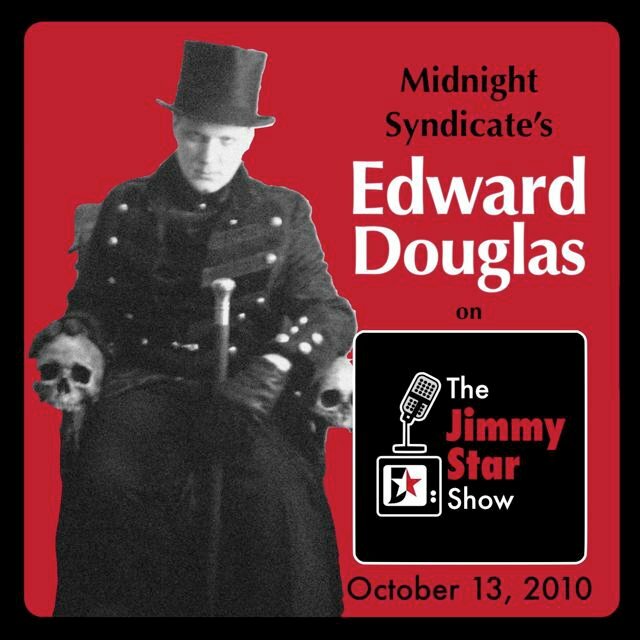 Edward Douglas of Midnight Syndicate will be a featured guest on The Jimmy Star Show Wednesday, October 13, 2010 at 3:00pm. Hosted by Jimmy Star and his cool crowd of co-hosts, they will discuss Edward’s latest projects within the entertainment industry. The Jimmy Star Show is radio’s new hit show, featuring the coolest in music, entertainment, fashion and pop culture, all from a fun industry insider perspective in a completely live, unedited fast-paced two-hour conversational format. Listen live at W4CY Radio. In yesterday’s episode of CSI (Blood Moon), the investigators’ case leads them to a Vampire/Werewolf Convention. Among the vendors the CSI production team wanted represented was Midnight Syndicate. 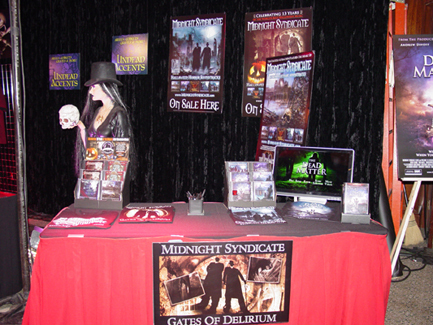 You can see pics of the Midnight Syndicate / The Dead Matter booth as it appeared on set (lights on). Many thanks to the show’s design team for sending these along. Hot off the heels of becoming Fangoria Magazine’s DVD of the Month – comes this incredible review from the horror pros over at Joblo.com’s Arrow in the Head! If you haven’t picked up a copy of The Dead Matter yet, you can still go to Hot Topic stores and www.HotTopic.com and pick up a 3-disc set for only less than the price of a regular movie. Click here for a complete list of other vendors. Support independent film and Midnight Syndicate and have great time doing it! From now through December, we will be posting some of the best entries from the Midnight Syndicate Video Contest, starting with Cellar from Michael Raisch (one of the two runners-up). New videos will be posted here every 4-5 days as well as on Facebook, Legions of the Night, and YouTube. Two more good reviews for The Dead Matter hot off the press. You can catch a live interview with Edward Douglas and Jimmy Star (co-host of Fright Asylum) on the Jimmy Star Show (www.jimmystarshow.com) Wednesday, October 13th at 4pm EST. The Dead Matter is now available at Hot Topic stores nationwide and at www.HotTopic.com. 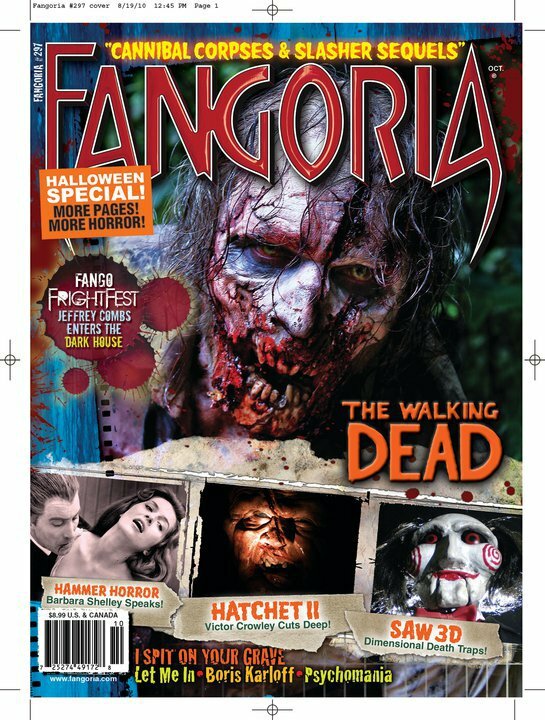 Fangoria Magazine selects The Dead Matter as its DVD OF THE MONTH in their October issue! 3-1/2 eyeballs! The full review can be found in the October issue (#297) of Fangoria Magazine, on newsstands now! 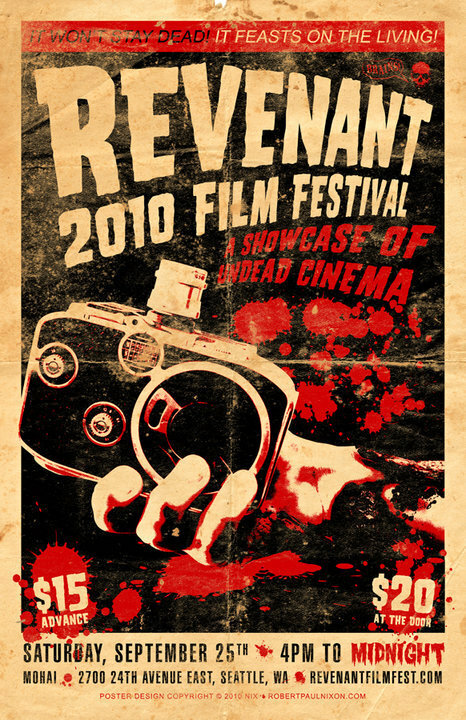 The Dead Matter is an official selection of the 2010 Revenant Film Festival. The event will be held at Seattle’s Museum of History and Industry this Saturday, the 25th. The screening begins at 7pm. For more information on this event and other Dead Matter screenings, visit The Dead Matter SCREENINGS page. 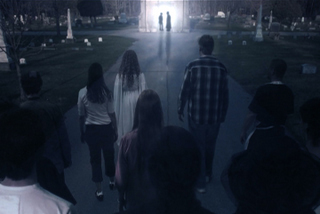 The latest installment of Robert Kurtzman’s Creature Corps: The Web Series features the rising of the zombie horde during the filming of the cemetery scene in The Dead Matter. Check out the behind-the-scenes shots of the zombie transformations, as well as several crew interviews. Please note, there is adult content in the video. Click here to watch. The Dead Matter will be screening at Canary Creek Cinemas as part of B-Movie Celebration next Saturday, September 25th at 7pm. A Q&A session with Edward Douglas and actor, Jim O’Rear will follow the screening. Both Edward, Jim, and actress Jessica Cameron will be in the Celebrities Room on Saturday afternoon and all day Sunday selling and signing The Dead Matter DVDs, posters and other merchandise. They will also be guests on several panels. Congratulations to Jim O’Rear who will be receiving a Golden Cob Award this year for his performance in The Dead Matter. Jessica Cameron will also be receiving an award for Best Rising Actress. For other The Dead Matter screenings and events, visit: www.thedeadmatter.com/screenings.htm. Shallow Graves – “One of the better indies that I’ve seen in a long time …definitely a film that you should say that you have seen. With the tagline of ‘Why rule the living when you can control the dead?’ Edward Douglas did a few things that I wouldn’t have even thought of which were fresh additions to this concept …with little nuances that would make a serious horror lover smile.” For the complete review, click here. 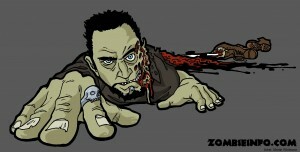 ZombieInfo.com gives The Dead Matter its seal of approval! The Dead Matter screening will begin at 6:30pm on Saturday, September 25th, and is free to all attendees of Horror Realm. The Dead Matter DVD and merchandise will also be on sale in the Exhibitors Hall on SATURDAY ONLY. On Sunday at 10am, Horror Realm will be screening Under The Scares, a documentary on independent horror filmmaking which features interviews with Edward Douglas, Gary Jones, and Robert Kurtzman, as well as Herschell Gordon Lewis, Lloyd Kaufmann, Michael Gingold, Debbie Rochon, Maurice Devereaux, and others. Edward Douglas said, “This is a ‘must see’ for any aspiring filmmaker, as it doesn’t pull any punches on discussing the current realities facing the industry.” For more on Under The Scares visit, www.underthescares.com. For other The Dead Matter screenings and events, click here. Listen to a live interview with Edward Douglas on Para-X Radio. This live show is hosted by Dave Jones and Jon Zaffis and will air Sunday, September 12th at 8pm Eastern. To listen live, click here. While there, click the “live chat” tab to join the chat room. 529 Films (creators of Midnight Syndicate’s Lost video), will have their film, Hellementary air on Chiller TV tonight, Wednesday September 8th, at 10pm EST and then again at 2am EST as part of Chiller TV’s Back To Ghoul series. For more on Chiller TV, visit http://www.chillertv.com/movies/. For more on Hellementary, visit www.hellementarythefilm.com. Midnight Syndicate’s songs Not Your Saviour and Shadows make appearances in the end credits. We’ve got a great Midnight Syndicate and The Dead Matter event for folks on the West Coast happening at Ghost Fest Expo 4 on board the haunted RMS Queen Mary in Long Beach September 17-19th. On Saturday, at 8pm, there will be a screening of The Dead Matter followed by a Q&A and signing with the largest Dead Matter cast reunion to date. Meet stars Sean Serino, Tom Nagel, CB Spencer, Meredith Beardmore, Donna Williams, Director Edward Douglas, Producer Mark Rakocy, and others. Edward Douglas and various cast members will also be on-hand throughout the 3-day convention in the Grand Exhibition Hall signing and selling DVDs, posters, and Midnight Syndicate merchandise. Tickets are $7.00 at the door. For other Dead Matter sreenings and events, visit www.thedeadmatter.com/screenings.htm. Robert Kurtzman’s Creature Corps: The Web Series has released another installment featuring The Dead Matter. This episode focuses on the filming of The Dead Matter at The Ohio State Reformatory in Mansfield, Ohio (seen in The Shawshank Redemption, Air Force One). The Reformatory has been called one of the most haunted places in the country, making it a perfect location to film a zombie uprising. Click here to go behind-the-scenes and check out the Creature Corp artists add the finishing touches to the zombie hordes. Check out new episodes every Friday at www.creaturecorps.net. The Dead Matter: Deluxe Edition is still available at your local Hot Topic store, while supplies last! Jennifer Holderness writes “…a total mish-mash of sub-genres that mix and mingle together to make a completely original viewing experience… director Edward Douglas, ‘music composer extraordinaire’, provides really solid moments of suspense with his set-ups, camera work, and music… strong music. I don’t usually say this but this DVD is worth a purchase… a beautifully produced release with a lot of extras.” For the full review, click here. To find the Hot Topic store nearest you, click here! The Dead Matter is an official selection for the first Horrorfind Film Festival at next weekend’s Horrorfind Weekend. Check out the film on Saturday, September 4th at 4:30pm. Meet cast member Jen Sharlow at the Midnight Syndicate booth in Dealer’s Hall all weekend where she will be selling and signing DVDs and other merchandise. Tickets to the festival are $10 and get you admission to all of the films featured. For more The Dead Matter screenings, click here. 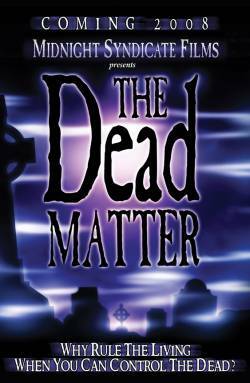 Horror News has just posted a tremendous review of The Dead Matter. NO SPOILERS here…just a lot of good reasons to check out the movie and a very entertaining read! For more reviews, click here. For The Dead Matter screenings and events, click here. The Dead Matter Deluxe Edition is still available at Hot Topic stores nationwide. To find the store nearest you visit the Hot Topic Store Locator. Midnight Syndicate and The Dead Matter have a lot in store for guests of DragonCon this year. On Friday, September 3rd, at 11:30pm in the Hanover C-E room of the Hyatt Regency Edward Douglas and Gavin Goszka will be holding their first-ever Midnight Syndicate panel. They will talk about the origins of the band, the journey, and take questions. On Saturday, September 4th at 11:30AM in the Centennial I room, there will be a screening of The Dead Matter followed by a Q&A panel with Tom Savini, Edward Douglas, and Jason Carter. Throughout the con you can catch Edward Douglas at the Midnight Syndicate table in the Dealer’s Room. Tom Savini will be in the Exhibitor’s Hall and Jason Carter will be in the con’s Walk of Fame area. You can also catch Gavin playing classic anime music live throughout the con (schedule available soon) and pick up a copy of his Kaleidoscope CD (www.homecirclemedia.com) at his table in the musician’s area of the Marriott. 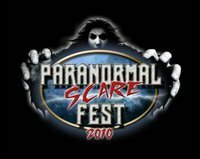 The Dead Matter will be screening this Saturday at 6pm at the Paranormal Scare Fest in Murfreesboro, TN. The screening is free with admission. Meet cast member Jim O’Rear at the screening and in the Celebrities Room throughout the weekend where he will be selling and signing The Dead Matter DVDs and posters. For other Midnight Syndicate and Dead Matter events, click here. Midnight Syndicate’s partners in crime, Robert Kurtzman’s Creature Corps, have just launched a new web series. This new 50-week original video series gives viewers a chance to see work inside a full-service make-up FX and film production studio. Check out new episodes every Friday at www.creaturecorps.net. This week’s episode features the crew on the set of The Dead Matter working on set pieces, props, and various FX. To check out the episode, click here. For more information on Robert Kurtzman and the story behind Precinct 13 and the Creature Corps check out the cool introductory video at www.creaturecorps.net. If you haven’t picked up The Dead Matter: Deluxe Edition yet, be sure to stop by your local Hot Topic store while supplies last! William Pattison of the Eric Morse Show calls The Dead Matter “…a wonderful character driven story, intelligent use of gore and special effects, and vampires and zombies as they should be, The Dead Matter is just what the horror fan ordered….I give it four stars…” To read the complete review, visit the Midnight Syndicate REVIEWS page. Zombos Closet and Horrorview give The Dead Matter thumbs up! Two new reviews for The Dead Matter have been posted on HorrorView and the great horror blog, Zombos Closet. WARNING! Both of these include some minor spoilers. To read Edward Douglas’ interview with Horrorview, click here. Photos from the first two The Dead Matter signings at GenCon and Hot Topic Mentor have been posted on Facebook. More events, screenings, and signings have been added including Rue Morgue’s Festival of Fear and Paranormal Scarefest Tennessee. 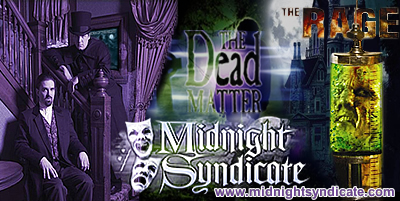 For a complete list of Midnight Syndicate and The Dead Matter events, click here! At 4:00pm on Sunday, August 29th, there will be a screening of The Dead Matter at the Rue Morgue Festival of Fear at Fan Expo Canada. There will be a brief Q&A session with Edward Douglas immediately following the screening. Edward will also be available the entire weekend at the Midnight Syndicate Soundtracks booth in the Exhibitors Hall. Admission is free to all attendees of Fan Expo Canada. For more Midnight Syndicate and The Dead Matter events and signings, click here! Check out this new interview with Edward Douglas on Mail Order Zombie. TheoFantastique gives The Dead Matter thumbs up and interviews Edward Douglas. Click here for the interview. Check out this new interview with Edward Douglas by Sue Goth Chick Granquist from Black Gate. Click here for the interview. The Dead Matter is unleashed! The Dead Matter is now available at Hot Topic stores nationwide and online at the Midnight Syndicate Store, HotTopic.com, and Amazon. Hot Topic will be selling a special 3-disc set that includes the DVD, new soundtrack CD, and Midnight Syndicate’s Halloween Music Collection all for the price of a regular DVD (for a limited time). To find the Hot Topic store nearest you, click here. The Dead Matter posters, t-shirts, and items are also available individually at the Midnight Syndicate Store. Join Todd Bates in a Midnight Syndicate weekend on Haunted Voices Radio starting July 30th at 9pm and continuing through August 1st. Both Ed Douglas and Gavin Goszka will be doing a live interview Sunday August 1st at 6pm Eastern. Along with the music and interviews, there will be FREE music giveaways! The Dead Matter coming tomorrow! First round of reviews in! One more day until the release of The Dead Matter, the soundtrack, and Midnight Syndicate’s Halloween Music Collection CD. What better way to get ready than to listen to Edward Douglas and Christopher Robichaud (Frank from The Dead Matter) live tonight at 8:00pm on Behind the Thrills? Get all the latest news on the new releases and screenings of The Dead Matter. The Dead Matter DVD goes on sale THIS FRIDAY at all Hot Topic stores nationwide and online at the Midnight Syndicate Store, HotTopic.com, and Amazon. Hot Topic will be selling a special 3-disc set that includes the DVD, new soundtrack CD, and Midnight Syndicate’s Halloween Music Collection all for the price of a regular DVD (for a limited time). To find the Hot Topic store nearest you, click here. At 9:00pm Eastern tonight on Sacred Division with Bishop James Long and Frances Etienne, there will be a live interview with Gavin Goszka and Edward Douglas. Christopher Robichaud, who played Frank in both releases of The Dead Matter, will also be there. 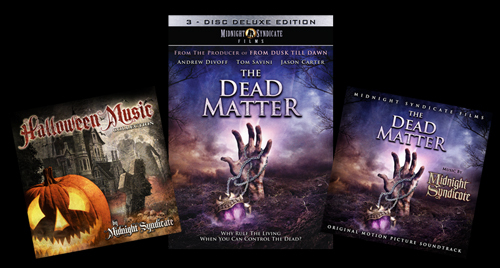 Find out the latest about The Dead Matter, the Soundtrack CD, and the new Halloween Music Collection CD, all being released on July 30th. Midnight Syndicate Video Contest Winners Announced. Three finalists to appear on The Dead Matter DVD coming this Friday! From a pool of filmmakers that spanned five countries, director Laura Lee from Oak Park, IL, nabbed first prize in the Midnight Syndicate Video Contest for her short film, Voodette. Voodette is about “a dead ballerina called back to be toyed with” set to the song Living Walls from The 13th Hour CD. Laura’s video, co-produced with her friend Marwin Cortez, whose own entry received high marks, will be featured on The Dead Matter DVD coming this Friday. Joining her on the DVD will be runner up Mike Raisch’s creepy video to the atmospheric track Cellar (also from The 13th Hour) and Red Clark’s dark spin on the track Crimson Door from Gates of Delirium. “The entries were so good, we couldn’t put just one video on the DVD as we originally had planned,” said Edward Douglas. “I wish we had room for more.” Midnight Syndicate will begin featuring the top fifteen entries right here, starting in August and continuing through the rest of 2010. “These films show creativity and the whole indie film-making spirit of making something very entertaining with little or no money,” Douglas added. “We are really looking forward to showcasing them.” The Dead Matter DVD will be available this Friday at Hot Topic stores nationwide, as well as here and on Amazon. For a sneak peek at Voodette, click here. 4 days till The Dead Matter DVD release! This Friday, The Dead Matter will be available at Hot Topic stores nationwide, as well as at the Midnight Syndicate Store and Amazon.com. At Hot Topic, it will be sold as a 3-disc set with the BRAND NEW The Dead Matter: Original Motion Picture Soundtrack CD and Midnight Syndicate’s 13th Anniversary Halloween Music Collection CD, all for the price of a REGULAR DVD! Special pricing is for a limited time only! Starting tomorrow, and in the following days, we will be announcing the winners of our Video Contest, giving you a preview of the DVD extras we’ve loaded on there, and posting some our first press reviews! Midnight Syndicate’s Gavin Goszka and Edward Douglas will be live tonight on The Buzz with Scotty Rorek and Zita Ost. Their segment starts at 9:30pm Eastern. To listen live, go to The Buzz on Talk Stream Live. The call-in number for the show is 262-672-2488. Check out a great new interview with Edward Douglas on this week’s edition of Rue Morgue Radio (July 16-22 edition). Hosted by Liisa Ladouceur the feature covers the movie, music videos, new CDs, and plans for the future as well as new music from The Dark Masquerade EP. 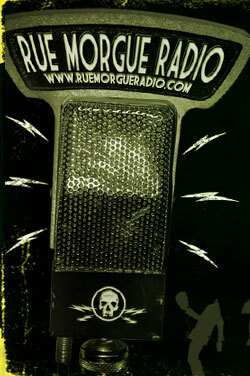 Click here to go to Rue Morgue radio where you can download or listen to the interview. Catch the latest news about the upcoming The Dead Matter movie, soundtrack, and Midnight Syndicate’s Halloween Music Collection CD, as well as details on all the special events and screenings, in a live interview on Sunday, July 18th on WBGU-FM Dead Air Paranormal Talk Radio. Listen live starting at 8:30pm EST. Heavy metallers Eternal Legacy have just premiered a music video for their song The Dead Matter from the upcoming The Dead Matter: Original Motion Picture Soundtrack CD. The video which features some never before seen clips from The Dead Matter will be included as an extra on the DVD which will be available along with the soundtrack CD at Hot Topic stores on July 30th (click here to find the Hot Topic store nearest you). The band premiered the video on the official video site of Germany’s Wacken Festival. Billed as the largest heavy metal festival in the world, Eternal Legacy will take the stage there this August with the likes of Iron Maiden, Red Hot Chili Peppers, Motley Crue, and Alice Cooper. Click here to check out the video. The first round of The Dead Matter screenings, cast signings, and special events has been announced on The Dead Matter SCREENINGS page. Events include: the first-ever Midnight Syndicate Panel at DragonCon, a double-feature in Chicago featuring The Rage and a Q&A session with Robert Kurtzman, Gary Jones, and Edward Douglas, a screening on board the haunted HMS Queen Mary, cast reunions, meet-and-greets, and more! The Dark Masquerade EP available now! 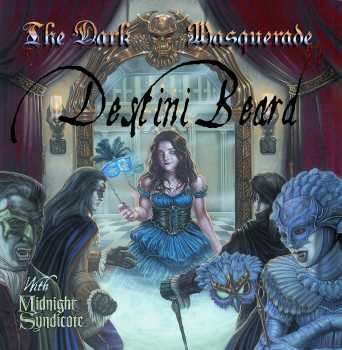 Listen to samples and order the new The Dark Masquerade EP now at the Midnight Syndicate Store! On July 2nd, Midnight Syndicate’s Linfaldia Records will release, The Dark Masquerade. This 6-song EP features lyrical soprano Destini Beard performing haunting vocals to five classic Midnight Syndicate tracks in addition to a previously unreleased remix from their vault. Destini is the daughter of world renown fantasy artist Ed Beard, Jr. For more information on the album, visit Destini’s The Dark Masquerade website. Midnight Syndicate’s second official music video, Lost, from the CD The Dead Matter: Cemetery Gates and the upcoming The Dead Matter movie is now available for viewing here and on YouTube. 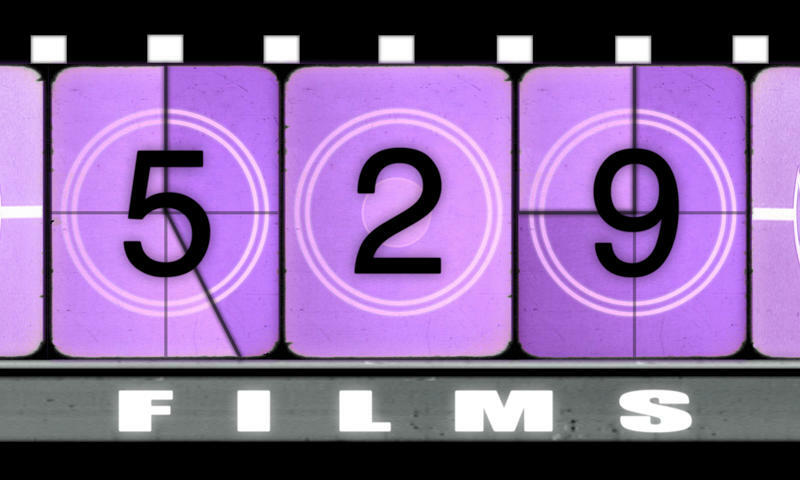 The video marks Midnight Syndicate’s first collaboration with director Andrew Smoley and his company 529 Films (Hellementary). Both the Lost and Dark Legacy music videos will be available as extras on The Dead Matter DVD, available at Hot Topic stores on July 30th. This brand new music video produced by 529 Films, features the song Lost, from The Dead Matter: Cemetery Gates CD and the upcoming The Dead Matter movie (July 30th). 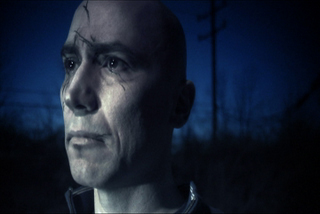 Starring Donna Williams (The Dead Matter) and Ray Goodwin (pictured here), the video explores a supernatural theme with a decidedly Syndicate twist. Shot in Midnight Syndicate’s backyard (Cleveland, Willoughby, and Chardon, Ohio), it features cameos from Patricia Valestin (The Dead Matter) and Nick D’Amico of Cleveland Classic Cinema. Behind the scene production photos coming soon on Facebook. Midnight Syndicate will release a special edition The Dead Matter DVD set that will be available at ALL Hot Topic stores nationwide on JULY 30th. The set includes 3 DISCS. The Dead Matter DVD – The long-awaited dark fantasy film starring Andrew Divoff, Jason Carter, and Tom Savini served up with a score by Midnight Syndicate in glorious 5.1 Surround. The DVD will be loaded with special features including TWO Midnight Syndicate music videos, several Midnight Syndicate Video Contest finalists, and another special feature to be announced soon. Check out the new official trailer below! The Dead Matter: Original Motion Picture Soundtrack CD – Clocking in at just under 75 minutes, this disc will include the score to the movie, composed by Edward Douglas, as well as other tracks that appear in the movie including ghost-rockers Lazy Lane. Also featured will be three exclusive Midnight Syndicate remixes as well as a special track from the heavy metal act, Eternal Legacy. 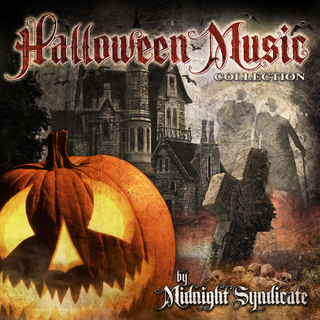 Midnight Syndicate’s Halloween Music Collection CD. This disc is a compilation featuring some of Ed and Gavin’s favorite tracks from their first 13 years. This special set will be available at all Hot Topic stores on Friday, July 30th all for the price a regular DVD! New The Dead Matter trailer and website now online! Check out the NEW official trailer to The Dead Matter on YouTube. Also be sure to stop by the newly-redesigned official Dead Matter website created by Bill Summers of Soundfeast Entertainment. Midnight Syndicate will be releasing a music video to the song Lost in mid-June. The video stars The Dead Matter‘s Donna Williams and was produced by Cleveland’s 529 Films, creators of the movie, Hellementary. The song Lost appears on both the The Dead Matter: Cemetery Gates CD as well as on the upcoming The Dead Matter: Original Motion Picture Soundtrack (July 30). Gruesome Joe of Rotting Flesh Radio has just posted an in-depth audio review of one of Midnight Syndicate’s most celebrated albums, The 13th Hour. In this segment, Joe breaks the disc down track by track. The perfect introduction for those not familiar with the disc and an entertaining retrospective for those who already are. The deadline for entries into the Midnight Syndicate Video Contest was this past Wednesday. We’ve received a lot of GREAT videos and we’re really looking forward to sharing them with you. Our winners will be announced at the end of this month. Many thanks to all of the talented filmmakers who participated! The song featured is original full-length version of Haunted Nursery from the Born of the Night CD. Our previous monthly prizes have been the self-titled Midnight Syndicate CD, Remixes from the Dungeon EP, and out-of-print t-shirts but this month’s prize is the most rare prize yet. An autographed poster from Midnight Syndicate’s 1997 self-titled debut. In addition to these monthly giveaways, all Photo Contest participants are entered in weekly drawings where winners are featured and receive a CD of their choice. You can still enter! Midnight Syndicate’s first official music video, Dark Legacy, from the CD The Dead Matter: Cemetery Gates is now available for viewing here and on YouTube. The video can also be seen at Shockya.com. Guests of this weekend’s HauNTCon in Orlando will get a chance to see the new The Dead Matter movie trailer and Dark Legacy music video up on the big screen Saturday night at HauNTCon’s Annual Costume Ball, co-sponsored by Midnight Syndicate and The Dead Matter. The music video, which features Ed and Gavin performing live together for the first time, scenes from The Dead Matter movie (coming July 30th), and members from fellow Cleveland music icons Mushroomhead, will go live here and on Facebook at 8pm EST. Among other things, the ancient holiday of Walpurgis Night marks the halfway point to Halloween 2010. See below for more information on the shoot as well as exclusive photos. Join Edward Douglas at NHC’s Opening Night Meet & Greet Party at 7pm on April 29th at the Valley Forge Convention Center in King of Prussia, PA. In addition to lots of Midnight Syndicate giveaways, Ed will also be providing the night’s music from his dark music collection and Syndicate archives. 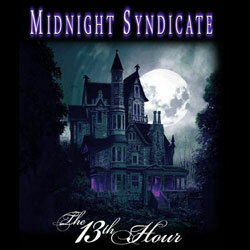 New Midnight Syndicate 13th Anniversary T-shirt Now Available! After a great debut at TransWorld, Midnight Syndicate’s 13th Anniversary T-shirt is now available at the Midnight Syndicate Store. These shirts are available in sizes Small through XXXL and shipping is included. While you are there, check out the newest The Dead Matter T-shirt. Christian Sellers asks some really good questions about The Dead Matter and Midnight Syndicate in this recent interview. Click here to read it. 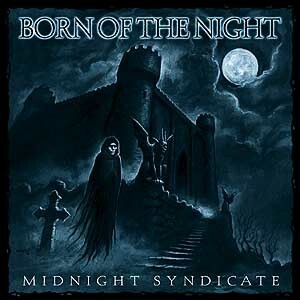 Our previous monthly prizes have been the self-titled Midnight Syndicate CD, Remixes from the Dungeon EP, and an original Born of the Night t-shirt. 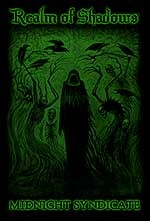 April’s prize is an out-of-print Realm of Shadows t-shirt (autographed per your request). In addition to these monthly giveaways, all Photo Contest participants are entered in weekly drawings where winners are featured and receive a CD of their choice. Edward Douglas will be at the Midnight Syndicate table all three days at this spring’s Chiller Theatre convention (April 16th – April 18th at the Hilton Parsipanny – Parispanny, NJ). In addition to the new Dark Legacy music video, he will also be screening the new trailer to The Dead Matter. Exclusive behind-the-scenes photos from Midnight Syndicate’s Dark Legacy music video posted to Facebook! Check out exclusive never-before-seen photos of Midnight Syndicate from their recent music video shoot on Facebook. While you are there be sure to become friends on Facebook as there will be a lot more announcements in the next several weeks including where you’ll be able to check out the video! The shoot which wrapped this past weekend was a complete success, leaving Midnight Syndicate and everyone involved extremely excited about what this first music video will deliver for fans. “It’s going to be awesome. Dave has incredible vision and the great team of artists at Precinct 13 and Screamline really delivered for us,” said a beaming Edward Douglas. adjacent Phantasy and Chamber Night Clubs. On hand with director David Greathouse were the incredibly talented artists at Precinct 13 Entertainment/Robert Kurtzman’s Creature Corps assisted by Screamline Studios and a talented group of haunted house actors from the region. Also making appearances in the video were fellow Cleveland music legends “Schmotz” and Jeff Hatrix of Mushroomhead (pictured to the left). Members of the Mushroomhead stage crew were also on hand to orchestrate the grand finale of the video. Between the music video, the new websites, and contests Midnight Syndicate fans have a lot to look forward to BEFORE July 30th – and there are STILL more huge announcements coming before then! Don’t miss a thing. Be sure to become friends with Midnight Syndicate on Facebook! This new interview by Nick Kelly (frontman from the dark metal band, Division) covers everything from The Dead Matter and Midnight Syndicate’s mark on Halloween music to adventures on the convention circuit. The full article can be read here. 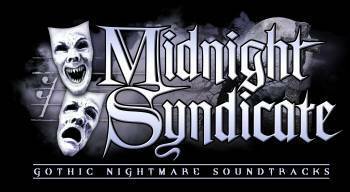 Midnight Syndicate to debut their first music video at TransWorld’s 15th Halloween & Attractions Show on March 25-28. Midnight Syndicate is teaming up with Precinct 13 Entertainment, Robert Kurtzman’s Creature Corps, and director David Greathouse to produce a music video for Dark Legacy from their The Dead Matter: Cemetery Gates CD. It is the band’s first music video in their 13-year career. Syndicate’s Edward Douglas, director Greathouse, and Robert Kurtzman will be on hand to premiere the video during The Dubliner Opening Night Celebration co-sponsored by Ken Donat and Westland Insurance at the TransWorld 15th Halloween & Attractions Show in St. Louis March 25th. It will also be on display all weekend at the Midnight Syndicate Soundtracks Booth #631. 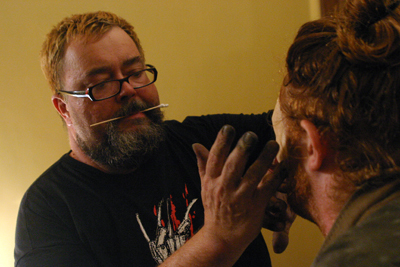 In addition to heading up Special FX Makeup on The Dead Matter, David’s directorial credits include Mushroomhead’s 12 Hundred music video which won Video of the Year 2007 on MTV2’s Headbanger’s Ball and their 2010 Your Soul is Mine video which appears on the Saw VI DVD. He also recently completed a documentary entitled Legion of Terror which is based on a notorious Northeastern Ohio haunted house acting troupe. 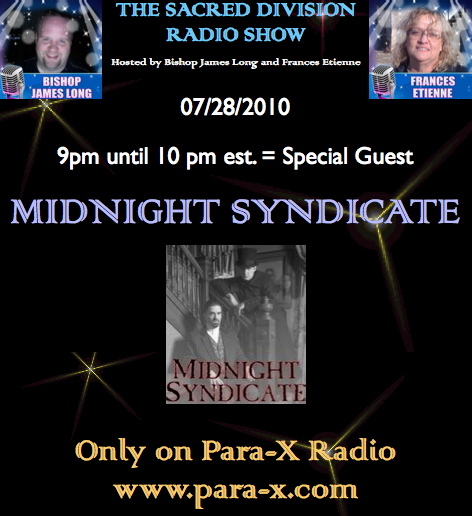 Midnight Syndicate on Para-X Radio’s Sacred Division Show Wed., Feb. 3rd. 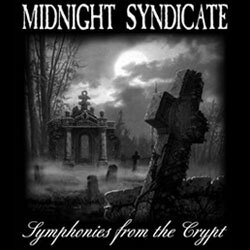 Do you have a Midnight Syndicate-related photo, artwork inspired by the music, haunt pictures, or stories from the present or past 13 years about how you’ve enjoyed or used the music? WE WANT TO HEAR FROM YOU! EVERYONE who submits a photo or story will be entered in ALL of our 12 MONTHLY DRAWINGS (prizes include rare Syndicate collectibles and autographed merch). Additionally, EACH WEEK, we will pick a photo to be featured on our websites. If your photo is picked, you will automatically receive a free Midnight Syndicate CD of your choice. Weekly winners will also still be eligible for the monthly drawings. We’re going to start off our monthly drawings with a bang. Everyone that enters before January 29th will be entered to win one of the last handful of Midnight Syndicate CDs (still in original shrink-wrap). It’s the CD that started it all 13 years ago. If you don’t win this time, you will automatically be entered for the next drawing in February! Prize to be announced. 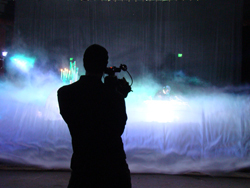 Interested in making your own silent film or video cut to Midnight Syndicate music? 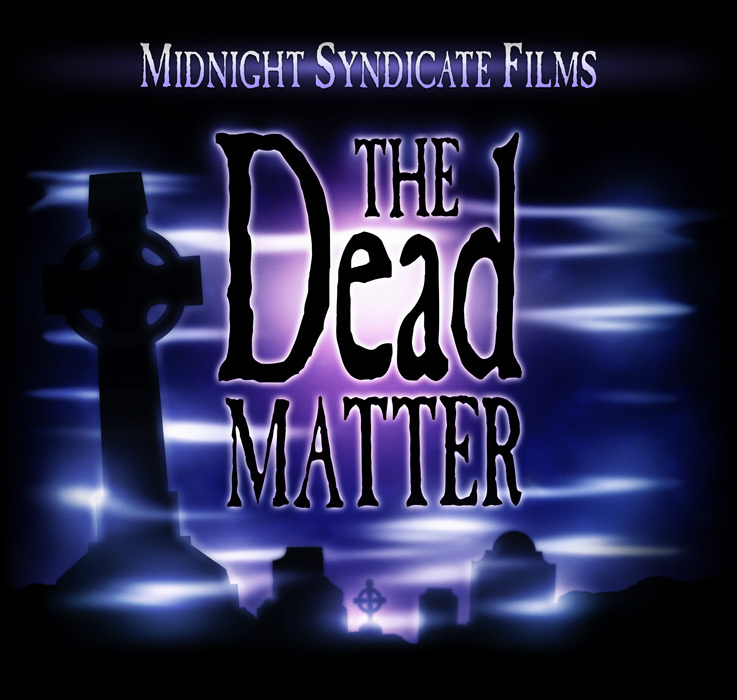 Midnight Syndicate is conducting a contest to give new or experienced filmmakers a chance to be featured on the upcoming The Dead Matter DVD and win other fabulous prizes. Entries will be judged on creativity and effectiveness. Our judging panel includes Dee Snider (Twisted Sister, Van Helsing’s Curse, Strangeland), Tom Savini (Friday the 13th, Dawn of the Dead), Robert Kurtzman (producer Dusk Till Dawn, Wishmaster), and Gary Jones (Xena, Boogeyman 3), as well as Edward Douglas and Gavin Goszka of Midnight Syndicate, with a few more industry names to be added shortly. The grand prize includes having your video featured on The Dead Matter DVD, hundreds of dollars in gift certificates from Screamline Studios (horror props, makeup FX, latex), Robert Kurtzman’s Creature Corps (horror props, costuming), and Conquest Graphics (posters, flyers, postcards), autographed merchandise from Van Helsing’s Curse, autographed props from The Dead Matter movie, and a complete collection of Midnight Syndicate CDs (including out-of-print titles). MORE GREAT FILMMAKING PRIZES TO BE ADDED! Big plans for Midnight Syndicate’s 13th Anniversary. The Dead Matter movie and soundtrack coming July 30th. 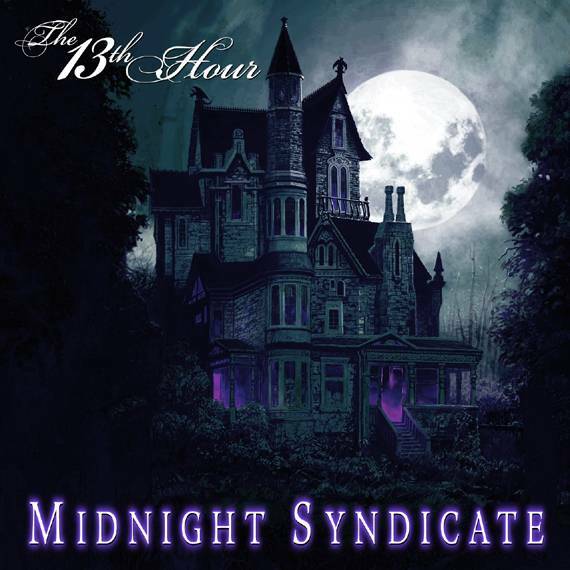 2010 marks the 13th Anniversary of the release of Midnight Syndicate’s self-titled debut CD. As a way of saying “thank you,” Midnight Syndicate will be giving away free CDs and autographed merchandise every week. In addition, they are hosting a video contest where fans can make their own silent film to a Midnight Syndicate track and win prizes, including a chance to have their video appear on The Dead Matter DVD (coming July 30th). See below for more details! Follow us here, on MySpace, Facebook, and Twitter. Updates every week and new announcements monthly! 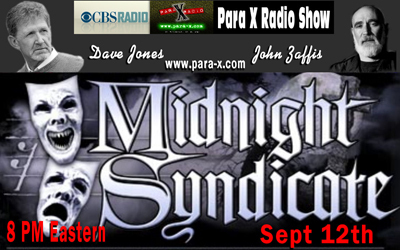 Check out Midnight Syndicate on Sirius/XM Halloween Radio this weekend! Along with classic tracks from Midnight Syndicate, you can hear Halloween stories from SIRIUS Stars and personalities (Martha Stewart, Deepak Chopra, Jay Thomas and Cousin Brucie, among them), Halloween-related interviews, sound effects, and more. All this weekend on Sirius Channel 126 / XM Channel 15 / Sirius Online Channel 810 / XM Online Channel 30. AOL Radio has just released a list of the Top 10 Best Halloween Music CDs as ranked by AOL/CBS Radio listeners. 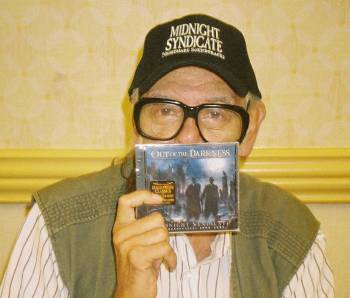 In the company of such greats as The Exorcist soundtrack and Rob Zombie, three of the ten CDs were Midnight Syndicate discs (Born of the Night #8, Realm of Shadows #4, and Vampyre #3) ranking only behind Danny Elfman’s Nightmare Before Christmas and John Carpenter’s classic Halloween soundtrack. Although out of print, Born of the Night and Realm of Shadows are still available at the Midnight Syndicate Store (while supplies last). Vampyre and Out of the Darkness (a collection of the best music from Born and Realm) are currently available at your local Halloween retailer! 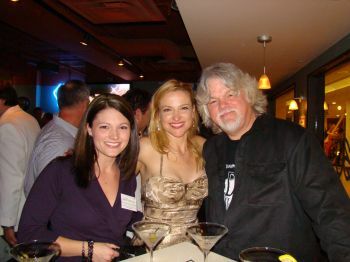 The Dead Matter sneak peek premiere in Cleveland. On Saturday, October 3rd the cast and crew of The Dead Matter met at Tower City Cinemas in downtown Cleveland to catch a sneak peek of the movie. For a great behind-the-scenes look at the event, visit Jim O’Rear’s SCARS blog and be sure to visit The Dead Matter on Facebook for more photos. Additional coverage can be found at Scene Magazine and Chagrin Valley Times. We hope to have news on a wide release date for the movie soon!! Count Gore DeVol interviews Edward Douglas on the upcoming sneak peek of The Dead Matter and the latest news on the project. Click here to see the complete video interview. 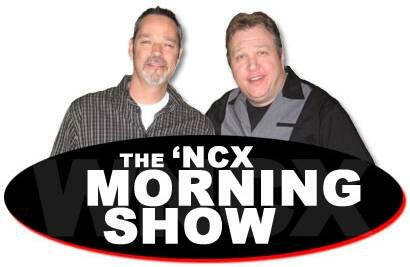 Edward Douglas and Christopher Robichaud on WNCX 98.5FM this Friday, October 2nd at 7:30am. 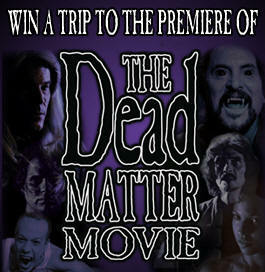 Win tickets to The Dead Matter sneak peek this Saturday! Catch Edward Douglas and Christopher Robichaud from The Dead Matter this Friday October 2nd at 7:30am on the WNCX Morning Show. To listen, tune in to 98.5 FM in Northeast Ohio or simply go to www.wncx.com to listen online. In addition to discussing the history and filming of The Dead Matter, they will be giving away at least two passes to attend a private screening/sneak peek of the The Dead Matter with the entire cast and crew this Saturday, October 3rd in Cleveland! 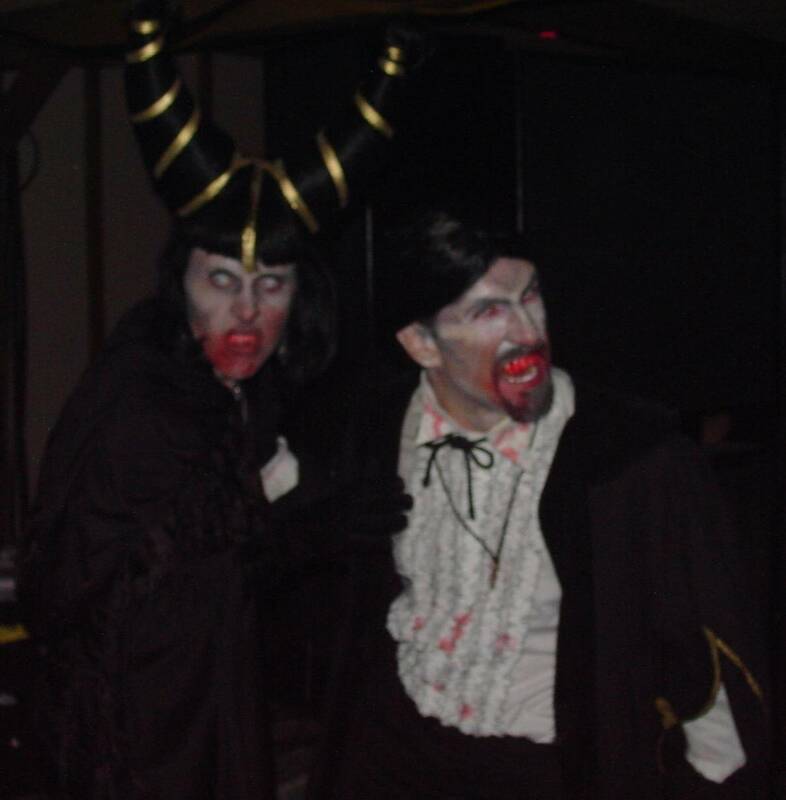 A bit of Midnight Syndicate trivia: WNCX was the first radio station to ever play Midnight Syndicate when Music Director Bill Louis and DJ Michael Stanley spun Something Wicked, Haunted Nursery, and Dark Tower in October of 1998. 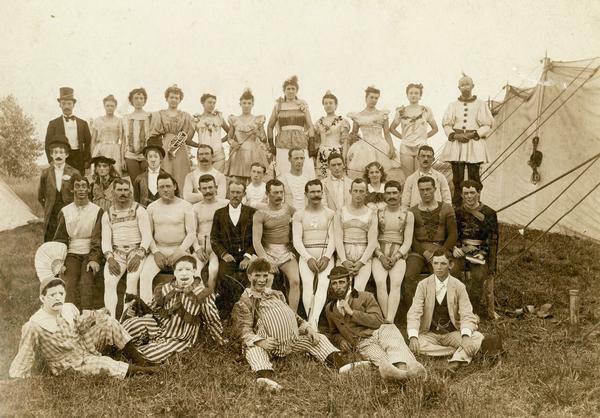 Additionally – the new morning show co-host Jeff Blanchard created and operated Cabaret Dada Theatre where Midnight Syndicate hosted their first (and only) live concerts back in March of 1998. 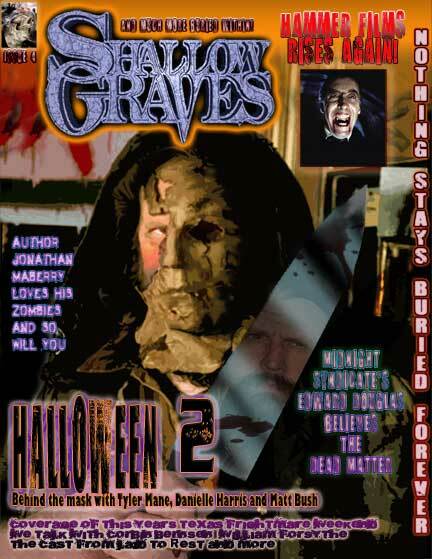 This new cover story in Shallow Graves Magazine features an in-depth interview with Edward Douglas on the movie and Midnight Syndicate. Click here to visit Shallow Graves Magazine and order a copy. Shallow Graves Magazine is a tri-annual publication that covers the latest news, celebrities and personalities involved in the supernatural and unnatural. Congratulations to Patrick from Bremerton, WA. He and a guest will be attending a private advance screening for the cast and crew of The Dead Matter on October 3rd at Tower City Theatres in Cleveland, Ohio sponsored by Pizza Pan, Thirsty Dog Brewery, and Tower 230. The Dead Matter zombie, Katie Bowman, graces the cover of this month’s Scars Magazine. This issue delivers three great cover stories on The Dead Matter, Midnight Syndicate, and TDM cast member, Jim O’Rear. Click here to visit Scars Magazine online and order an electronic or hard-copy version. Stop by the Midnight Syndicate Soundtracks booth at these upcoming conventions and meet Edward Douglas of the band and The Dead Matter. Gavin Goszka will be joining Ed at GenCon where he will also be performing music from classic anime films live as part of GenCon’s programming schedule. Check out new interviews with Edward Douglas on TheoFantastique and Geek in the City. For all of the latest features and interviews about Midnight Syndicate and The Dead Matter movie, check out The Dead Matter: Cemetery Gates Reviews/Interviews page. Edward Douglas of Midnight Syndicate and Robert Kurtzman of Precinct 13 Entertainment (producer From Dusk Till Dawn, co-founder KNB FX, co-producer The Dead Matter) will both be appearing at the Midwest Haunters Convention, signing autographs at Booth #807 from 11:00am until 1:00pm on Saturday and debuting an exclusive Haunter’s Edition of The Dead Matter movie trailer. Spotlighting some of the haunters involved in the project, the trailer will be shown at both the Midsummer Monster Bash (8:30pm) and the IAHA Masquerade Party (10:30pm), as well as on the bus tours. Kurtzman will be at Midwest Haunters Convention unveiling his Creature Corps line of haunted attraction props, masks, and special makeup items. The Dead Matter is officially complete. Post-production wrapped the last week in April with director/composer Edward Douglas and sound editor, Patrick Giraudi, finalizing the mix, and colorist Jim Garrow dialing in the finishing touches. 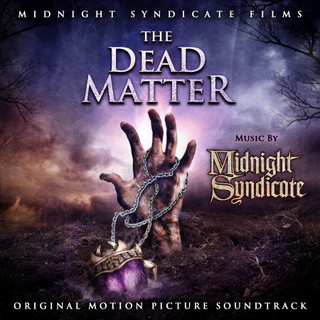 Although no official date has been set, Midnight Syndicate announced that they will be releasing an official soundtrack to The Dead Matter in coordination with the movie’s release. 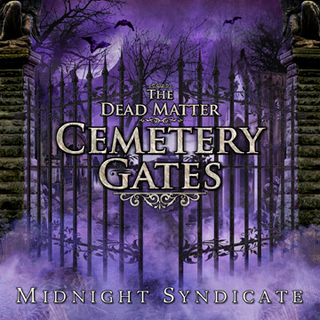 In August of 2008, Midnight Syndicate released the critically-acclaimed The Dead Matter: Cemetery Gates CD which was a collection of music inspired by the movie. In addition to being named one of the top horror CDs on FEARnet’s 2008 countdown, the disc recently won runner-up for Best CD in the horror fan-voted Rondo Awards. On March 27, haunters from across the country gathered at America’s Center Convention Complex for the 2nd annual International Association of Haunted Attractions Awards Banquet. Dubbed the “Oscares,” this event honors individuals from the Haunted Attraction industry for their outstanding contribution and dedication to the art of haunting. 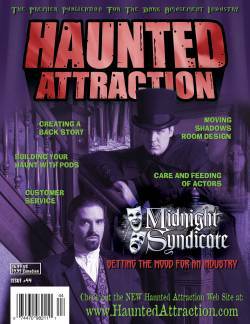 At the event, Midnight Syndicate was honored with the Vendor Excellence Award for their service to the haunted attraction industry. We thank all of our supporters who have helped make it possible for us to continue to do what we do! 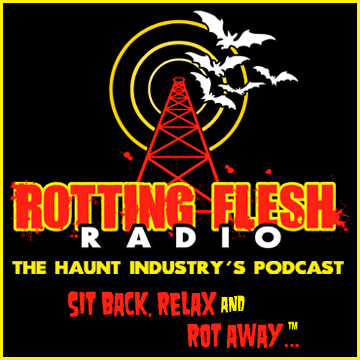 Co-host Debbie Rochon from Fangoria Radio will be talking with Ed and Gavin about the band, The Dead Matter, and music in horror. The show airs this Friday, March 6th from 10pm to 1am EST and can be heard on SIRIUS CHANNEL 102 / XM CHANNEL 155. 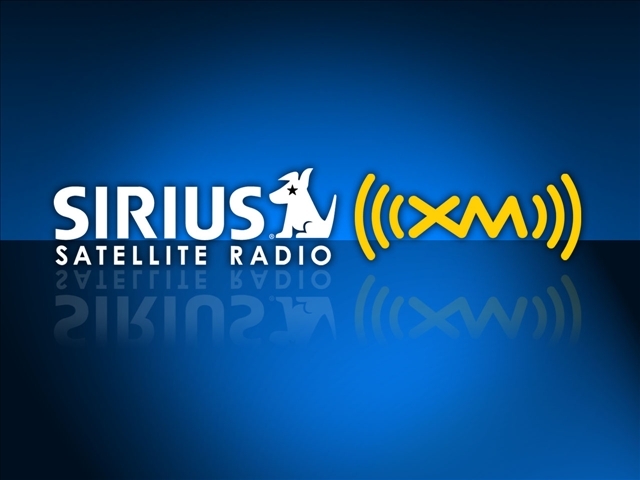 To sign up for a free three-day Sirius XM pass CLICK HERE! You can also sign-up for Fangoria’s free podcasts on iTunes. All clips are listed in the iTunes Store under the “Podcasts” tab, simply search for “FANGORIA”. The final stages of post-production on The Dead Matter are underway with scoring, sound, and visual effects in full swing. More updates coming soon! The Dead Matter: Cemetery Gates CD was included in FEARnet’s list of Best In Music 2008. You can read the article and their interview with Edward Douglas here. Winners of The Dead Matter Flyaway Contest brought to you by Midnight Syndicate Films and Hot Topic will be picked in a few months once the official release date for the movie is announced. Good luck to everyone who entered! Check out new interviews with Edward Douglas on FANGORIA and FEARnet. Midnight Syndicate is also featured in the most recent issue of Screem Magazine (#17). Click on the logo above to hear a song-by-song breakdown of the new release. Many more reviews have been added to the website as well. Visit The Dead Matter: Cemetery Gates press page to hear what others are saying about our newest release. See what people are saying about the new CD here. The trailer to The Dead Matter is now available at www.T3nTh1rtyOne.com, a Halloween website hosted by Hot Topic stores. Visit www.T3nTh1rtyOne.com to see the new trailer and enter the The Dead Matter Flyaway Contest brought to you by Midnight Syndicate Films and Hot Topic. You and a guest can win a flight to the premiere of the movie, complete with hotel accommodations, limo service, and a meet and greet with Midnight Syndicate and the cast. Other prizes include a complete set of all ten Midnight Syndicate CDs and limited-edition autographed movie props hand-crafted by Robert Kurtzman’s Creature Crew FX-artist Sean Rodgers. Restrictions apply. Must be 18 or older to enter. More details available on the www.T3nTh1rtyOne.com website as well as www.HotTopic.com. Desmond from Dread Media talks to Edward Douglas about the new CD and upcoming movie. The interview can be heard at http://www.earth-2.net/podcasts/dreadmedia/episodes/dreadmedia_052.mp3. The interview begins at 27:50 minutes in. Beyond the cemetery gates the dead do not rest easily. An ancient Egyptian relic, vampires, and the living dead lurk amongst its shadowy crypts. Midnight Syndicate’s signature soundscape and haunting symphonies call you into the world of the undead that inspired the upcoming motion picture . . . The Dead Matter: Cemetery Gates, the long-awaited follow-up to The 13th Hour arrives just in time for the Halloween season. Inspired by the themes of vampirism, living dead, and occult relics explored in the upcoming The Dead Matter movie, the new CD was created in the style of Midnight Syndicate’s other releases taking listeners on a musical journey of their own creation. The Dead Matter: Cemetery Gates is available nationwide at Halloween stores and at other retailers that specialize in Halloween merchandise (party stores and costume shops). Click here to utilize our store locator and find a Midnight Syndicate retailer near you. Click here to hear samples. Two tracks (Alchemist’s Chamber and The Revenants) from the upcoming CD are now available to preview on Midnight Syndicate’s MySpace page. Two additional tracks (Tear of Osiris and The Hunt) can be heard on a trailer for the CD that has just been added to Midnight Syndicate’s official website. If you missed the first The Dead Matter movie trailer at Comic-Con, you can catch it on the road at: GenCon, Horrorfind Weekend, Rue Morgue’s Festival of Fear, and DragonCon. Both Edward Douglas and Gavin Goszka will be at GenCon. Edward Douglas will also be at the Festival of Fear and DragonCon. The Dead Matter trailer will be released on the Internet in early September along with some other major announcements — so stay tuned! Rotting Flesh Radio will be debuting several tracks from the upcoming Midnight Syndicate CD, The Dead Matter: Cemetery Gates on its show this Friday, July 11th at 7pm EST. At 9pm EST, Gavin Goszka and Edward Douglas from Midnight Syndicate will be live with Todd Bates on Haunted Voices Radio. Ed and Gavin will play more exclusive tracks from the CD as well as discuss their plans for the rest of 2008. The Dead Matter: Cemetery Gates CD coming August! This August, Midnight Syndicate will unleash its first all-original, independent release since The 13th Hour. The Dead Matter: Cemetery Gates takes listeners on a journey into the dark world of vampires, ancient relics and the living dead that inspired The Dead Matter motion picture (coming early 2009). Look for updates and preview tracks in the next few weeks! Director, Edward Douglas and four of the main leads from The Dead Matter movie will be in the MIDNIGHT SYNDICATE SOUNDTRACKS booths (#4914 and #4916) at this year’s San Diego Comic-Con. Sean Serino (Gretchen), Tom Nagel (Mike), CB Spencer (Jill), and Christopher Robichaud (Frank) have been confirmed and will be on-hand at the booth showing the movie’s FIRST TRAILER talking about the film. Acting icons of the haunted attraction industry, Geoff Beck and Bob Turner have teamed up to deliver the ultimate acting training DVD, Hauntertainer University. It will be premiering at the Midwest Haunters Convention on June 13th and 14th. Featuring the music of Midnight Syndicate, the DVD is geared towards actors in the haunted attraction industry who already have a couple of years of experience under their belt, but want to be able to have the tools that will help them cultivate their ability in developing more refined, complete, and entertaining characters. The goal of the DVD and the program is to make an actor more skilled and capable of acting and preforming in any situation with the confidence and attitude to deal with any response the audience delivers. In this new, in-depth interview posted on Revenant Magazine, director Edward Douglas talks about the ups and downs of filming The Dead Matter, what Midnight Syndicate fans can expect from the film, and plans for the rest of 2008. Over the years, the band has been contacted by fellow artists who enjoy listening to the music while working on their own creations. A list of some of the ones that have contacted us over the past year are featured at Legions of the Night. Recently, two authors have incorporated Midnight Syndicate into their stories. Reminiscent of the old Kiss comic books, the first is Phantom Music Box one of the latest in Chris Cantrell’s Asylumantics comic book series. In this story, an ancient music box has been discovered that is rumored to have the power to control the dead. Supernatural artifact collectors Midnight Syndicate are in a race against time to retrieve the box before it falls into the wrong hands. Have your ever wondered what would happen if a zombie was bitten by a vampire? Can jinn and demons make zombies? Why is Midnight Syndicate playing a vampyre club and why does a zombie attack during their first set? 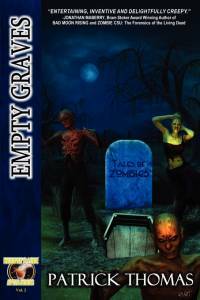 The answers to these questions and more can be found in Empty Graves a very original and entertaining collection of zombie-themed short stories for fans of the undead. The book, written by Murphy’s Lore’s Patrick Thomas, is now on sale at Amazon. If you are an artist who enjoys the music of Midnight Syndicate and would like to be featured on Legions of the Night, please contact info@legionsofthenight.com. We’d love to hear from you. In addition to the Visual FX work being done at PRecinct 13, work on Midnight Syndicate’s The Dead Matter: Cemetery Gates CD and the score is also underway. The Dead Matter: Cemetery Gates CD is a disc of music inspired by the themes in the film as well as some music from the actual film that will be released in August of this year. “Just in time for Halloween,” said Gavin Goszka. “we’re really happy with how the disc is coming together. It will definitely give people a taste of what is to come.” Stay tuned for more updates! More reviews for The Rage soundtrack posted in the RAGE REVIEWS section. The first reviews for the Original Motion Picture Soundtrack to The Rage are now posted. Look for more in April! Click here to go to the RAGE REVIEWS section. Visit www.HotTopic.com for a store nearest you. The Rage soundtrack is UNLEASHED! The Rage soundtrack and the movie are now available! Initially the soundtrack is available at Entity Productions Online Store and will soon be available on CDBaby and Amazon.com. In several weeks the CD will also be available at other outlets including Hot Topic stores that have music sections. Two tracks from the upcoming The Rage soundtrack are now available to preview at Midnight Syndicate’s MySpace Page. 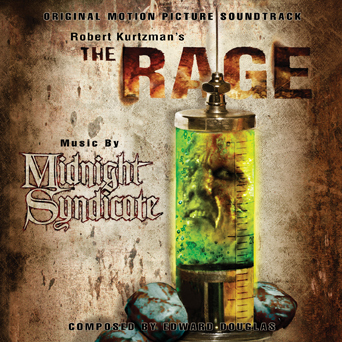 On February 26th, 2008 Screen Media Films / Universal Home Entertainment will be unleashing Robert Kurtzman’s movie, The Rage and Midnight Syndicate will also be releasing the soundtrack to the film. PREVIEW TRACKS from the CD coming soon! Gavin’s Parlormuse CD, It’s Not The Coat Makes The Gentleman is now available! Gavin’s solo project, Parlormuse‘s Debut is now available. The CD takes Victorian-era popular music and blends it with modern instrumentation and a folk-rock sensibility. It features lush three-part vocal harmonies and a wide range of instrumentation – both acoustic and electric. To purchase the CD and for more information, visit www.ParlorMuse.com. Listen to a Midnight Syndicate and Virgil Franklin Music Marathon on Haunted Voices Radio starting Friday, December 21st at 8:00 PM CST and running until 12 midnight on Saturday, December 22nd. Featuring interviews, a chat room, requests, rare and unreleased Midnight Syndicate tracks, the world premiere of music from The Rage sountrack and Gavin’s Parlormuse disc, and giveaways including a complete collection of autographed CDs. The show will be broadcast on Sirius Radio. Be sure to tune in from 9pm to 11pm on Friday, December 21st for an interview with Gavin Goszka and Edward Douglas plus the WORLD PREMIERE of tracks from The Rage soundtrack and Gavin’s Parlormuse CD. 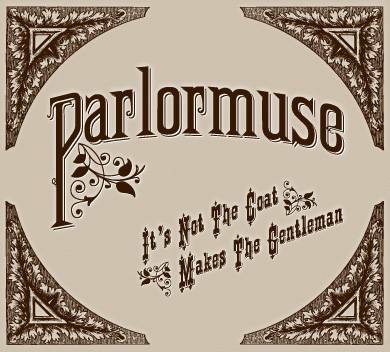 Work has officially completed on Gavin’s solo project Parlormuse It’s Not The Coat Makes The Gentleman. While it will still be two or three more weeks before the CDs are back from manufacturing and available for sale, be sure to check in at www.parlormuse.com for updates. Gavin says that both a full listening station and details about where to purchase the CD are forthcoming, along with many other changes and additions. Four tracks are currently available for preview at The Parlourmuse MySpace page. Gentleman takes Victorian-era popular music and blends it with modern instrumentation and a folk-rock sensibility. The album features lush three-part vocal harmonies and a wide range of instrumentation – both acoustic and electric. Entity Productions is now able to clear its remaining stock of the original Born of the Night and Realm of Shadows CDs (both out of print). Both CDs will only be available while supplies last. To purchase, visit the Entity Productions store. Although the official release for the movie has not been announced, The Dead Matter soundtrack will be released in late-August 2008. A movie soundtrack created in the style of Midnight Syndicate’s other releases, The CD will contain music inspired by the film mixed with music from the actual film. The Dead Matter soundtrack CD is designed to stand on its own and to draw you into the supernatural world of the living dead that we create in The Dead Matter says Douglas, “The CD will also allow people who watch the movie to journey deeper in the world as we push further into its themes and character.” With post-production moving right along, fans can expect the The Dead Matter trailer early next year. All we can say is that the final product will be worth the wait! “The Dead Matter is definitely a character-driven horror film, so a lot rides on our actors. They all really came through for us. Between the performances by our veterans and our newer faces, audiences are going to be in for a real treat,” said Douglas. With a projected release date in 2008, post-production has already begun. That includes work on the next Midnight Syndicate release, The Dead Matter soundtrack. The PHOTOS section on The Dead Matter site has pictures of the cast and crew in action with MORE coming soon! Be sure to stop by both this site and The Dead Matter site for trailers, news, soundtrack updates, interviews, and much, much more! More production photos from Weeks 2 and 3 have been posted at The Dead Matter website’s PHOTO section. For a look at what’s been happening behind the scenes of The Dead Matter so far, check out Frank Purtiman of Smudgeline Productions’ trailer for the Making of ‘The Dead Matter’ documentary. Production for The Dead Matter is underway!!! Midnight Syndicate Films has announced that production for The Dead Matter is officially underway. Photos will be available throughout production. Visit The Dead Matter website’s PHOTO section for pictures from the first two days of shooting. Production will continue for the next four weeks. 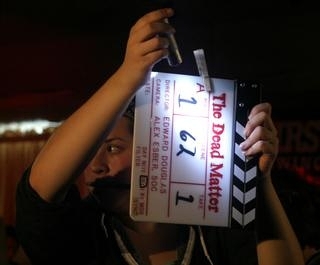 The first pre-production photos for The Dead Matter have been posted on The Dead Matter website’s PHOTO section. Midnight Syndicate has teamed up with Universal Studio’s Halloween Horror Nights 17 and has created 2 new tracks for this year’s Carnival of Carnage. Building the Carnival can be heard at www.MySpace.com/MidnightSyndicate. Gavin Goszka’s other side project, Parlormure explores the world of 19th-century American popular music, but with a decidedly modern twist. Bringing Victorian-era songs into the 21st century via contemporary folk-rock arrangements, the result is an intriguing blending of old and new. “What was originally intended to be a three-song demo for booking performances quickly expanded into a full-length album. Things were just falling together very spontaneously and I figured I’d run with it and see what happened,” said Gavin. Incorporating three-part vocal harmonies and a wide range of instrumentation – both electric and acoustic – the album’s sound evokes the spirit of yesteryear while keeping a firm foothold in the world of today. “I really wanted to make sure the original character of the songs carried through, but that at the same time it would remain entirely approachable to a modern audience,” Gavin adds. It’s Not The Coat Makes The Gentleman is scheduled for release in early September, but preview tracks are currently available on www.MySpace.com/Parlormuse. More information about Parlormuse can be found at www.homecirclemedia.com. 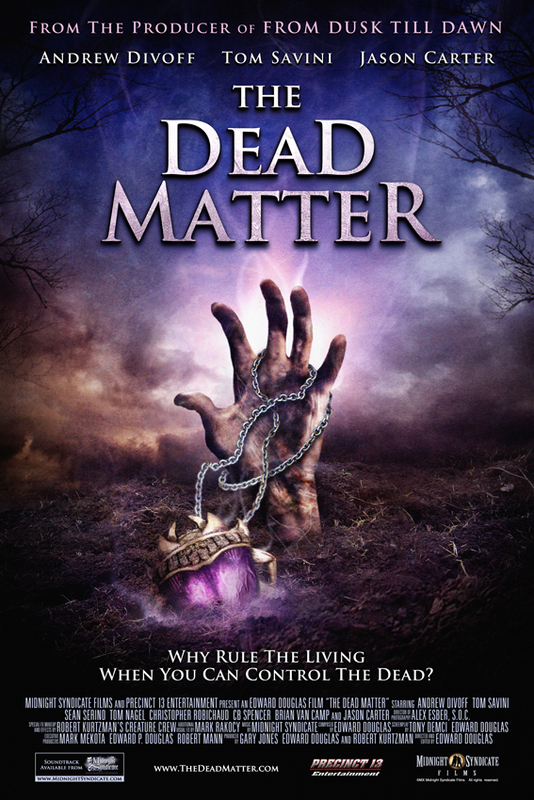 Check out July 13th’s podcast from Rue Morgue Radio to listen to an interview with Edward Douglas featuring a discussion on The Dead Matter. Midnight Syndicate Films has announced a new round of cast signings. Sean Serino will be returning to Precinct 13 studios where she shot The Rage last year. This time around, she will be taking on the lead role of Gretchen. Gretchen’s boyfriend, Mike, will be portrayed by Tom Nagel (North Mission Road, Beast of Bray Road). For more information on Tom, you can visit his official website. Cleveland-born and raised, Tom joins the growing list of Ohio natives on The Dead Matter cast and crew. CB Spencer (Passions, Ally McBeal) will be playing Gretchen’s friend and confidant, Jill. More on CB can be found at www.cbspencer.com. Fans of Midnight Syndicate will hear a familiar voice as Christopher Robichaud (The Dead Matter (1996), Midnight Syndicate) reprises his role as Frank from the original The Dead Matter movie. Christopher has been a regular voiceover artist on Midnight Syndicate albums beginning with the self-titled debut and including Gates of Delirium and the Dungeons & Dragons roleplaying soundtrack. Brian Van Camp (New World Disorder) will be playing Mark Pym, an apprentice to vampire hunter, Ian McCallister (played by Jason Carter as previously announced). Unit Production Manager/Assistant Director, Phil Garrett, Director of Photography, Alex Esber, and Precinct 13 Makeup and FX Artists, David Greathouse (Mushroomhead) and Alan Tuskes (Cabin Fever, Hulk) are among the key crew that have been signed to the project. More information on cast and crew can be found at the The Dead Matter IMDB listing. Andrew Divoff (Wishmaster, Air Force One), who was seen most recently as the eye-patch-wearing villain, Mikhail Bakunin, on ABC’s Lost and will be seen in the upcoming film, The Rage, will be joining the set of The Dead Matter as the character, Vellich, after completing work on a new, untitled, Steven Spielberg movie that is scheduled for release in May of 2008. Vellich’s arch-nemesis, Ian McCallister, will be played by Jason Carter whose career spans everything from his renowned portrayal of Marcus Cole on Babylon 5 to characters on shows like Beverly Hills 90210, Angel, Charmed, Third Rock from the Sun, and in films like Demon Under Glass. 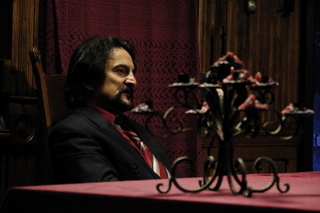 Horror-FX legend Tom Savini (Dusk Till Dawn, Dawn of the Dead), a fixture in the genre for over thirty years and seen most recently as Deputy Tolo in Grindhouse, will be portraying the devious vampire overlord, Sebed. After wrapping production on his upcoming film, Ghouls, in April, producer Gary Jones (Xena, Army of Darkness) and director/producer, Edward Douglas (Midnight Syndicate), began pre-production for The Dead Matter. Principal photography will begin this August in Mansfield, Ohio. The FX team at Precinct 13 has already begun work on what promises to be a visual treat for audiences. Photos and teasers will be available in the next month. Gavin and Ed will be teaming up with the creative forces behind Halloween Horror Nights on a special project this season. More details to follow in the upcoming months. Pre-production officially began mid-April after the completion of The Rage. Casting has been underway for several weeks now so fans can expect big announcements early next month! Now you can order your Midnight Syndicate merchandise directly through our website. Midnight Syndicate music ALL WEEKEND! Featuring unreleased Midnight Syndicate REMIXES performed by Gavin Goszka and other artists!! Todd will be up all weekend to take your Midnight Syndicate call-in requests and questions for the band LIVE on air. You do not need to register or login to listen to the show or to enter the chat room. 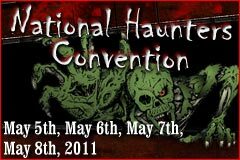 The entire weekend will be aired live at www.HauntedVoicesRadio.com and will be archived and free to download. Midnight Syndicate Weekend continues on WPARanormal Talk Radio – WPARanormal Talk Radio will continue the Midnight Syndicate Weekend, Sunday April 15th, on their weekly radio show broadcast from Haunted Voices Radio. The show starts at 9:00pm Eastern Standard Time and runs until 11:00pm. You can listen live at www.wparanormal.com or www.HauntedVoicesRadio.com. To receive our monthly newsletter email Sarah at info@midnightsyndicate.com. While Midnight Syndicate is in the studio finishing the score to The Rage, the crew at Precinct 13 Entertainment has begun preparing for pre-production on The Dead Matter, which is scheduled to officially begin in mid-April. Fans can expect more updates on The Dead Matter once things are underway next month. Be sure to visit the official website at www.TheDeadMatter.com for the latest updates. The first run of the new The Dead Matter t-shirts that debuted at Haunt X and TransWorld are now available through the Midnight Syndicate Store. The new t-shirt is the first of several designs planned for the movie and was designed by Mark Rakocy, Midnight Syndicate graphic designer and co-producer of the original The Dead Matter movie. 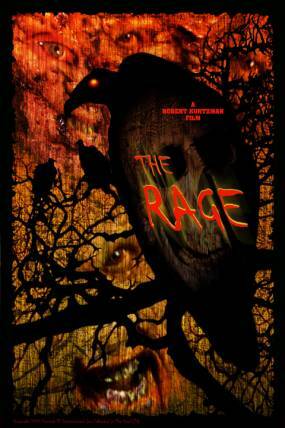 Since January, the band has been locked away in the studio working on the score to Robert Kurtzman’s The Rage. The score will be completed in mid-April, with final mixing commencing immediately afterwards. The Rage will be previewed at the West Coast edition of FANGORIA’S Weekend of Horrors Convention – May 18th-20th in Burbank, California. 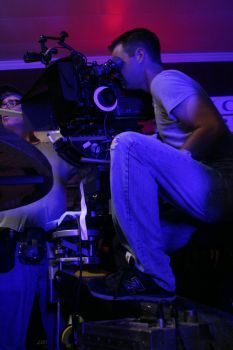 Be sure to check on our site, as well as www.TheRageFilm.com, for information on a release date as it becomes available. Ed says the new trailer for the film is awesome and will give fans a good idea of what to expect from the film. Plans for the release of the soundtrack/score to The Rage are already underway. Edward Douglas of Midnight Syndicate will be at HauntCon, May 4th-6th, at the Hyatt Regency in Dearborn, Michigan. There are a number of excellent events planned for the weekend, so it should be a great time for all involved. 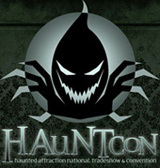 For more information about the show, please visit www.HauntCon.com. A promo video scored by Edward Douglas for the upcoming movie CrackJaw is now up on YouTube. The film is based on Family Traditions, a novel by Edward Lee and John Pelan, and is about dueling gourmet chefs who go in search of a rare eel and discover more than they bargained for in a freshwater lake inhabited by voracious creatures and surrounded by redneck cannibal hillbillies. The film is to be directed by Shay Prentice, and Midnight Syndicate is set to create the score. Look for updates on the project this summer. 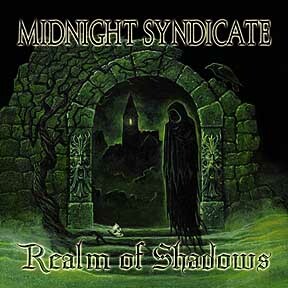 Midnight Syndicate’s Legions of the Night is dedicated to fans and supporters of the band. Writers, artists, and musicians from every facet of dark entertainment are featured on the site. If you would like to submit artwork, poetry, short stories, photography, or other work that has been inspired by Midnight Syndicate’s music, please contact info@legionsofthenight.com. We’ve recently received several animations set to the music of Midnight Syndicate. If you have a short video you’d like to share with us, please send it along so we can share it with the rest of the LOTN community! 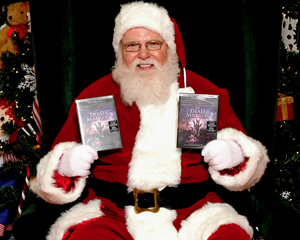 Multiple CDs planned for release with film – Midnight Syndicate will be teaming up with Hollywood FX legend Robert Kurtzman (Dusk till Dawn producer, co-founder of the KNB EFX Group) and his production company, Precinct 13 Entertainment to produce the horror-suspense film, The Dead Matter. Development has been underway for several months and pre-production will officially begin March 1st. Principal photography is scheduled to begin in Northeastern Ohio this August with a projected release date sometime in 2008. Edward Douglas will be directing the film and producing it through the newly-formed Midnight Syndicate Films division of Entity Productions, Inc. The company is currently in talks with Doug Bradley (Pinhead from the Hellraiser series) and Andrew Divoff (Wishmaster, Air Force One, Lost) to star. “This is a really exciting time for us. 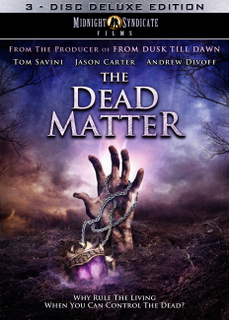 One of our main goals over the past ten years has been to get into a position to remake The Dead Matter with an actual budget,” said Edward Douglas ho produced and directed an earlier version of the film for $2000 in 1996 before forming Midnight Syndicate. “Horror movies are at the core of what Gavin and I do in Midnight Syndicate. It’s what we love and that’s why we believe in remaking this particular film. Co-writer Tony Demci and I have had a lot of time to take what we felt was already a good story and develop it into something very special that we know is really going to deliver for both our fans and other fans of the horror genre.” The Dead Matter tells the story of a vampire relic with occult powers that falls into the hands of a grief-stricken young woman who will do anything to contact her dead brother. The Next Midnight Syndicate CD – Entity Productions plans to release multiple discs of new Midnight Syndicate material in coordination with the film. “As far as the next Midnight Syndicate CD goes, fans are really going to like what we have planned for the soundtrack,” said Gavin Goszka, who will serve as Music Supervisor for the film. “The Dead Matter soundtrack CD will be in the style of our other Midnight Syndicate releases. Our plan is to integrate music from the movie with new material and atmospherics which will allow listeners to further explore the dark and supernatural world created in the The Dead Matter film. The album will feature an original story concept, created and developed by Goszka, and promises to take the listener on an immersive journey into an exotic world filled with mystery, peril and ancient secrets waiting to be unearthed. “With Midnight Syndicate, we strive to leave the stories open enough to allow the listener to fill in the details as he or she desires. This album is completely the opposite – there is a definite storyline and cast of characters here.” He confesses that playing the role of fiction writer has been an exciting, although sometimes daunting, challenge. “The music has had its own set of challenges, but ensuring that the story is compelling and effective has, without a doubt, been the greatest task thus far. Add to that the fact that I want the individual tracks to be self-contained enough to stand on their own outside of the overall whole.” For news and updates on the project, fans can check both the Midnight Syndicate website and www.HomeCircleMedia.com. The filmmakers behind Sin-Jin Smyth will be in Germany this upcoming week for the Berlin Film Festival. Although not part of the official competition, a version of the film will be screened for the European press. Sources close to the project report that here in the United States, the producers have been asked to cut the film’s dark, politically-charged, end of the world ending and cut the film into a PG-13 framework. This is something the filmmakers have refused to do and it has reportedly made negotiations with distributors difficult. 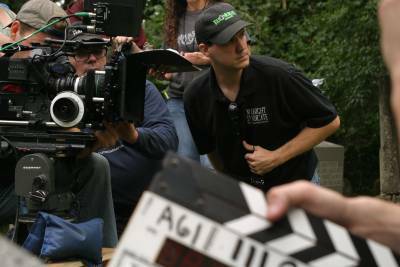 Sin-Jin Smyth filmmakers have also had to work around a few days of action elements that they have not been able to finish shooting since their star, Roddy Piper, was diagnosed with cancer last year. We here at Entity Productions, along with all of Roddy’s fans worldwide, wish the best for Roddy and his family during this difficult time and look forward to his return. We also wish everyone at Snap Kick Productions the best of luck down the final stretch! Check out new Midnight Syndicate interviews at Paragon Magazine and Side-Line Magazine, as well as a live interview with both Ed and Gavin on Haunted Voices Radio. Gamers should be sure to check out the interview with Edward Douglas at Pulp Gamer. For a complete list of recent interviews, click here. The new Syndicated Legions MySpace fansite is now live with giveaways and contests coming soon. 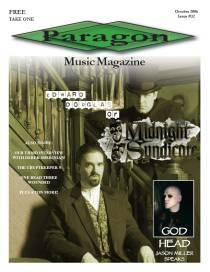 In other news, the latest issue of Paragon Magazine features a new interview with Edward Douglas. 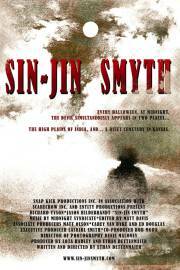 Additionally, the horror e-zine, Evil Dread recently featured a review of the rough cut of Sin-Jin Smyth. The article includes some interesting insights into the making of the movie and the buzz that has surrounded the project since its inception. Check out a new interviews with Gavin Goszka at The Haunted Report and Darker Than The Bat, a new podcast broadcast featuring T.J. Mannarino from Universal Studios – Orlando and Edward Douglas at Islands of Adventure Fan Central (Midnight Syndicate interview starts at 29 minutes), and an interview featuring both Ed and Gavin in the new Side-Line Magazine # 56. For more information and new photos from filming, visit The Rage page under Movie Scores. 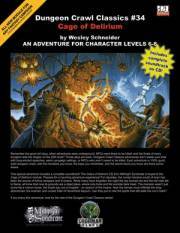 See below for more information on this d20 module designed around Gates of Delirium. Available at Goodman Games and your local hobby store. Midnight Syndicate’s, The 13th Hour took home the 2006 Silver ENnie for Best Gaming Aid or Accessory at the annual ENnie Awards held at GenCon in Indianapolis, August 11th. Although a panel of judges determines the nominees, the voting is fan-based, so many thanks to everyone who voted! To all our fans and supporters. THANK YOU! The new d20 adventure module inspired by, packaged with, and designed around the use of Midnight Syndicate’s Gates of Delirium CD, will make it’s debut at this year’s GenCon convention in Indianapolis, August 18th through the 21st. 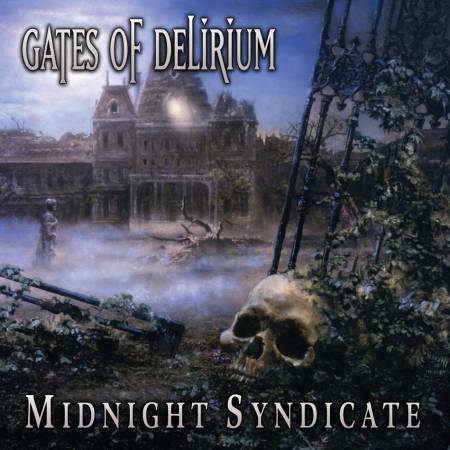 Cage of Delirium includes Gates of Delirium as a complete soundtrack specially cued to the adventure. Each room instructs the DM to cue the appropriate track, providing a truly immersive role playing experience. In addition to being on hand at the Midnight Syndicate Soundtracks booth throughout the show, both Edward Douglas and Gavin Goszka will be at the Goodman Games booth on the 19th from 1pm to 2pm for a signing with the module’s creator, Wes Schneider. For more information on the module, see the May 25th post below or visit the Goodman Games website. In other gaming-related news, Midnight Syndicate’s The 13th Hour has been nominated for an ENnie Roleplaying Award for Best Gaming Accessory. More information to follow. The Midnight Syndicate caps are now available online through the Entity Productions Merchandise Store. Out of the Darkness now available! Click here for availability. To listen to one of the new tracks visit Midnight Syndicate on MySpace. For more information on the CD, see our June 14th post below. Midnight Syndicate’s CD, The 13th Hour won the award for Best Gaming Accessory at the 2006 Origins Awards held in Columbus, Ohio June 30th. The Lovecraft-inspired disc was a particular hit with fans of Call of Cthulhu and other horror role-playing games. 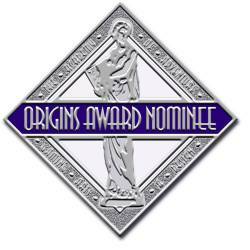 The Origins Awards are administered by the Academy of Adventure Game Art & Design. The Academy, consisting of members of the game development community, pares down a broad selection of the year’s best products and then votes to determine the best product from a broad variety of categories. Edward Douglas was on hand to receive the award. “It’s an honor to be recognized like this. The gaming industry has been extremely supportive of us over the years,” Douglas said, “one of the first stores to ever carry Midnight Syndicate discs was a game store down in Kent, Ohio called Spellbinders.” Douglas went on to thank the fans, GAMA, and the Syndicate’s liaison to the gaming industry, horror board-game designers, Twilight Creations (Zombies!! !, Haunting House). Prisoner of Time from the upcoming Out of the Darkness CD is available now at Midnight Syndicate on MySpace. “The basic sketch of the track had been lurking in the archives for quite some time,” says Gavin, “we decided it was finally time to unearth it.” Prisoner of Time is one of the previously unreleased tracks on the upcoming disc. The new cover art for Gates of Delirium will make its way onto shelves throughout 2006. Designed by Out of the Darkness artist Rob Alexander, the new cover features one of the first renditions of Haverghast Asylum. Mark Rakocy’s classic interior montage (including his iconic Midnight Syndicate silhouette shot which was the basis for the Out of the Darkness cover) has not been changed. Before the Haverghasts, before the haunted asylum and the Crypts of the Foresaken, there was Arcacia, a ruined village by the sea with a dark past and a mysterious link to an ancient tower hidden away among the cliffs of the Northern Jarls. 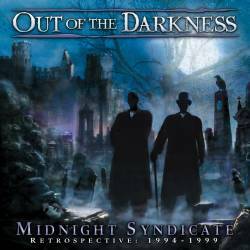 Out of the Darkness (Retrospective: 1994-1999) features re-recorded and re-mastered horror music classics from Midnight Syndicate’s Midnight Syndicate, Born of the Night, and Realm of Shadows as well as four previously unreleased tracks. The disc also features previously unreleased material including selections from two of Edward Douglas’ early horror films (The Dead Matter and Journey Into Dementia). An updated take on the early signature tracks that helped launch Midnight Syndicate, Out of the Darkness invites listeners to return to the haunted village of Arcacia where it all began. The CD will be available July 4th. Check back at this site or Legions Of The Night for availability. NEW Legions of the Night fan site up! The new Legions of the Night fan site is up and running at www.LegionsOfTheNight.com. Featuring dark art, photos, poetry, haunted attractions, gaming companies, and much more, the site is run by fans for the fans and supporters of Midnight Syndicate and the horror community. For forum-style fansites be sure to stop by Midnight Syndicate on Yahoo and Midnight Syndicate on MySpace. 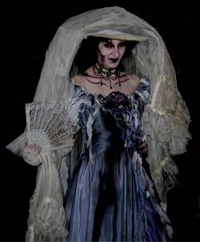 For over 14 years, Haunted Attraction Magazine has been covering the Halloween and Dark Amusement industries. Issue # 44 features an in depth, eight-page cover story on the history of Midnight Syndicate, it’s impact in the industry, and plans for the future. Featuring up close and personal stories from Edward Douglas and Gavin Goszka, along with plenty of never before seen photos and images from the early years of Entity Productions and Midnight Syndicate, this issue offers a unique insight into the band’s history. Goodman Games and Midnight Syndicate are pleased to announce they have partnered to produce Dungeon Crawl Classics #34: Cage of Delirium, the first d20 adventure module designed with a soundtrack. This all-new adventure of spine-tingling horror comes packaged with Gates of Delirium, the haunting Midnight Syndicate soundtrack, is authored by Dragon editor Wes Schneider and features all-new cover art by classic D&D artist Erol Otus. The CD will help create an incredibly rich role playing experience where the spooky mood of a haunting adventure becomes ever more real. Various encounter areas within the module specify instructions to the DM on which track to play from the CD. Certain encounter areas might even play multiple tracks as events occur. Scheduled for release in August 2006, Dungeon Crawl Classics #34: Cage of Delirium will be packaged as a 64-page adventure module with the accompanying CD shrink-wrapped inside. The new official Sin-Jin Smyth website includes a movie trailer, cast and crew bios, character profiles, production stills, storyboards, and much more. Midnight Syndicate’s The 13th Hour has been nominated in the Best Gaming Accessory category of the 2006 Origins Awards. 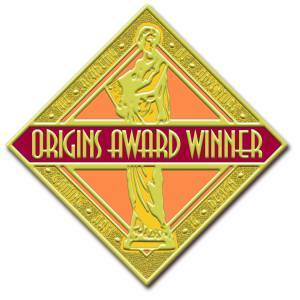 The Origins Awards are administered by the Academy of Adventure Game Art & Design. The Academy, consisting of members of the game development community, pares down a broad selection of the year’s best products and then votes to determine the best product from a broad variety of categories. The winners will be announced at this year’s Origins convention in Columbus, Ohio on July 1st. 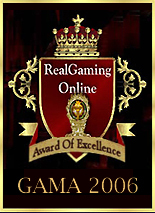 Midnight Syndicate was the recipient of both Real Gaming Online’s “Award of Excellence” and their “eChoice Award” atthe 2006 GAMA trade show in Las Vegas. Other honorees included: Wizards of the Coast, AEG, Wizkids, Bandai Games, and Karmel Games, HL Games, Margaret Weiss Productions, Your Move Games, and Shadow Star. Midnight Syndicate was one of five recipients of the Ghoulish Gallery’s 2005 Isabella Award. “The award recognizes those in the dark attraction industry who, through personal conduct and business ethics go above and beyond the call of normal business practices to raise the bar and set new standards of excellence for our industry as a whole. It’s companies like Midnight Syndicate/Entity Productions that help our industry become more legitimate in the world market place,” said Tim Turner of Ghoulish Gallery. Cited were Midnight Syndicate’s Haunted Attraction Registry program and the recent The 13th Hour disc. In other news, Reel Horror recently had the opportunity to view some early footage from Sin-Jin Smyth and posted his comments here. We regret to inform you that the Born of the Night and Realm of Shadows CDs (MS1002-CD and MS1003-CD) have been discontinued. Those particular discs were the subject of an agreement with a third party and that party recently terminated the agreement. Thus, we can no longer offer those CDs. 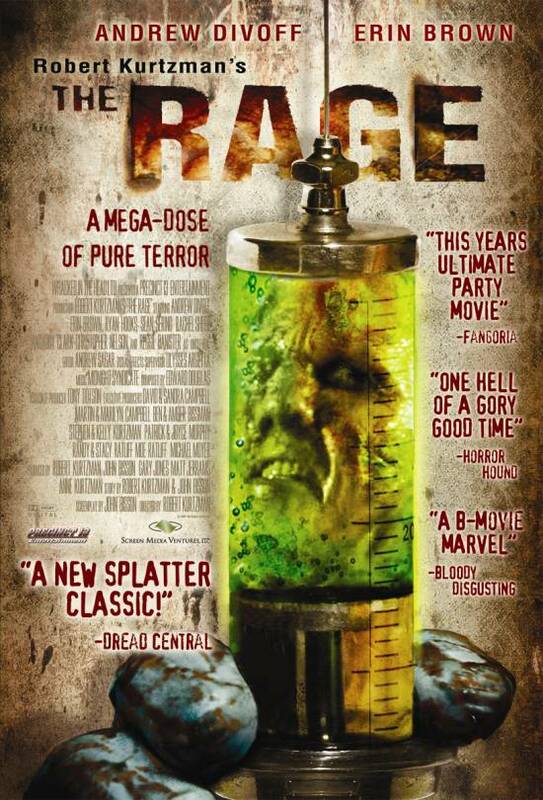 Midnight Syndicate is teaming up with director and special FX master Robert Kurtzman to score his upcoming horror film, The Rage. Hidden in his makeshift laboratory deep within a secluded forest, a scientist fallen into madness has created the ultimate virus, which he plans to unleash against our capitalist society. When his experiments on innocent victims don’t go as planned, the abominations he’s created break free and escape into the wilderness. The infection spreads as vultures devour the remains of his freakish monsters, transforming the birds into mutations driven by “The Rage,” an insane blood lust for human flesh. The Rage is the latest motion picture event from Robert Kurtzman. Robert, creator of From Dusk Till Dawn, director of Wishmaster, and co- founder of the prolific make-up effects studio, KNB EFX (Chronicles of Narnia) has opened his own film production facility called Precinct 13 Entertainment (special effects for The Hostel and Devil’s Rejects). Precinct 13 will be producing the film. “It’s great to be working with a legend like Robert Kurtzman,” said Edward Douglas. “I was able to view the first 20 minutes of the movie and it looks incredible. It’s going to be a great project.” “I am totally pumped about working with Midnight Syndicate,” Robert Kurtzman said. “I have been a big fan for years, and to have them on board is a huge thrill for everyone involved in this production. What makes it all the more exciting is having them so close to us in Cleveland, adding significant clout to this true ‘Buckeye’ production. I can’t wait to hear what they come up with!” For more information, visit The Rage page on our site and the official The Rage website. 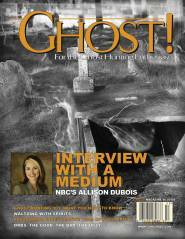 In the October issue of this new publication dedicated to ghost hunting, Gavin discusses Midnight Syndicate’s plans for the future along with his own close encounters with the paranormal. The official Sin-Jin Smyth website has been updated with new photos and information. Stop by to get a closer look into the production of the film (scheduled for release in the Fall of 2006). One of the first production stills from the Sin-Jin set has been posted along with an interview by Grave Thoughts Radio and director, Ethan Dettenmaier. 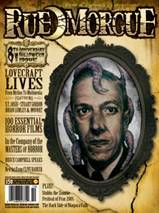 The story appears in Rue Morgue’s Halloween Issue (#50) and features an interview with Edward Douglas. An interview with Gavin Goszka and Edward Douglas has been posted on Space Junkies along with more reviews. Click here for details. This venerable darkwave e-zine has been producing Darkwave BioAnimes for five years now and is once again featuring Midnight Syndicate and the new disc along with some other great Goth- Electro-Industrial artists. On Thursday Sept, 22 in a ceremony at the Intercontinental Hotel in Cleveland, Edward Douglas was presented with an Innovator Award from Smart Business Magazine. In coordination with Anthem Blue Cross / Blue Shield, the award is given to individuals in business who continue to set the pace for innovation in their fields. As president of Entity Productions, Edward has handled the business side of Midnight Syndicate since its inception. Click on the Fans button on the menu to visit Midnight Syndicate’s Legions of the Night fan page. A tribute the greatest supporters in the world, this page features artwork, pictures, and more as submitted by Syndicate fans and supports. Updated regularly, the page also includes featured haunted attractions and home haunts. Midnight Syndicate, Screamline Studios, and several other companies are teaming up with Dustin Diamond (Screech from Saved by the Bell) on his Haunted Masquerade to benefit the Children’s Hospital of Wisconsin. Doors open October 8th at 5:30 for cocktails and a silent auction, followed by dinner, a live auction, giveaways, and a Comedy Show. Items include: Club Med vacations, autographed memorabilia, Halloween props, and one-of-a-kind Halloween collectibles. For more information visit The Dustin Diamond Foundation website. See what people are saying about The 13th Hour. 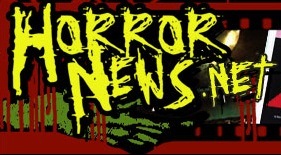 Press reviews have been posted along with an interview with Edward Douglas and the Horror Channel. With pre-production of Sin-Jin Smyth in full swing, updates are flooding in. From new casting developments (like Jonathan Davies of Korn), to Midnight Syndicate’s collaboration with Billy Duffy of The Cult, be sure to check out the NEW Sin-Jin Smyth Updates Page for the latest breaking news! 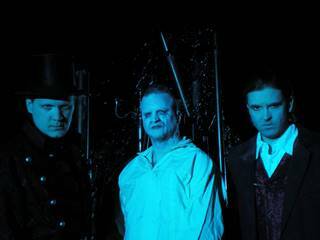 Set in a haunted Victorian mansion inhabited by the Haverghast family (Gates of Delirium), The 13th Hour features Midnight Syndicate’s signature dark gothic orchestration blended with classic 80’s-style horror movie music and chilling sound effects that put you right in the middle of a haunted house with a sinister history. Listen to preview tracks at MySpace. The CD is currently available at all Hot Topic stores that have music departments as well as through our other vendors, and at the Midnight Syndicate Store. Reviews coming soon along with pictures from the June 4th CD Release Party in Cleveland, OH. The 13th Hour CD Release/Listening Party has been scheduled for Saturday, June 4th at the Phantasy Concert Club in Cleveland, OH. Produced in cooperation with Screamline Studios, the party will include door prizes, limited edition giveaways, and rare films from the original Midnight Syndicate multimedia concerts of 1997. 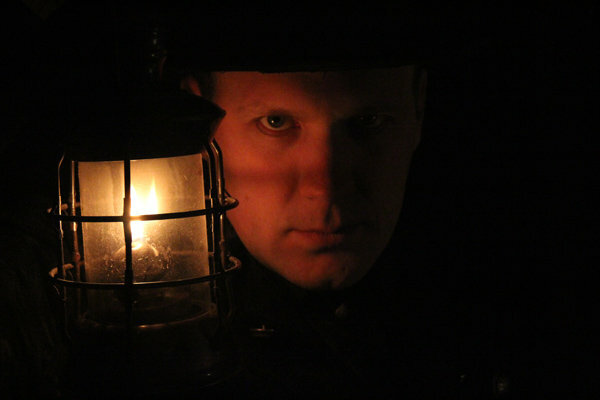 Come in costume, meet members of the Haverghast family, and join professional actors from haunted attractions across Ohio (including the Feature Creatures from Columbus) as we create Halloween in June. In addition, there will be a presentation by Psychic Sonya from Haunted Cleveland Tours set to the music of The 13th Hour and live performances by horror-rock outfits Lazy Lane & industrial rockers Filament 38, and State of Being. The event will be MC’d by Jesse of WMMS 100.7 FM‘s Native Noise show. The Phantasy Concert Club is located at 11802 Detroit Ave. in Lakewood, OH. Still more details to come. Learn more about Edward, Gavin, and the story of the band in Scene Magazine. Two tracks from The 13th Hour now online! Fallen Grandeur and Family Secrets from the upcoming June 7th release, are now available for preview at MySpace. A partnership has been announced between Midnight Syndicate and Chaosium Games (creators of the game, Call of Cthulhu) for The 13th Hour. “The 13th Hour is perfect for Call of Cthulhu,” said Chaosium Games’ Dustin Wright, “I’ve been listening to the album constantly since it’s arrival. The music takes you on a journey through Haverghast Mansion and beyond to The 13th Hour.” Midnight Syndicate founder, Edward Douglas, said “We’ve been looking forward to working with Chaosium for a while. When we developed the theme for The 13th Hour we knew that it would lend itself perfectly to Call of Cthulhu. The disc is designed around exploring the sinister side of the supernatural, mysteries of the dark, and the unknown, while creating a sense of paranoia – all core elements to the Call of Cthulhu experience that make this legendary RPG so exciting and effective.” Check back here and the Chaosium Games site for more special updates. On June 7th, The 13th Hour will available at all Hot Topic stores that have music departments. Stop by to hear the disc and pick up a copy! Additionally, pre-orders for The 13th Hour CD and t-shirts are being taken at the The Midnight Syndicate Store as well as through some of our other vendors. Edward Douglas and /or Gavin Goszka will be on hand at the Midnight Syndicate Soundtracks booth at all of these events to meet and greet fans, so be sure stop by. Lily Lane, lead singer from the ghost-rock outfit Lazy Lane will be making an appearance on the upcoming The 13th Hour disc. “Lily’s haunting voice is a perfect match for this disc,” says Edward Douglas, “it’s taken a CD that we’re already excited about and moved it up another notch.” “Her vocal effects brought many of the tracks to life in a way that simply wouldn’t have been possible otherwise,” says Gavin Goszka, “really effective.” In addition to performing at Midnight Syndicate CD Release Parties, the Pittsburgh-based band has just released it’s second disc, Keepers of the Gloom. For more information visit their site at www.thelazylane.com. 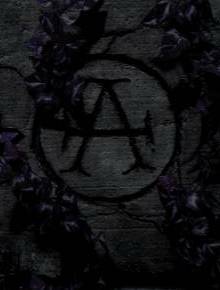 As of November 15th, the new address for Midnight Syndicate inquiries and merchandise orders is: Entity Productions, Inc. – Attn. Midnight Syndicate – 11510 Boxwood Circle – Chardon, Ohio 44024 – USA. The new fax number for orders is (440) 285-2449. Congratulations to Instrumental Music Director, Bill Heffelfinger and the Bad Axe Marching Hatchets Vanguard for placing fourth (Flight IV) in the Michigan Competing Band Finals held at the Silverdome in Detroit. For their performance, Bill arranged a montage of Midnight Syndicate songs from the Realm of Shadows, Gates of Delirium, Vampyre, and Dungeons & Dragons CDs. Combining it with dramatic visuals and a storyline he developed, the band performed the piece in competitions throughout Michigan. For more information on the Bad Axe Vanguard and stills from their performances, click here. To see larger versions of the images featured above, click on them. The music of Midnight Syndicate is featured as the score to the first episode of Tom Savini’s new anthology series, Chill Factor. Directed by Tom Savini, this first episode entitled, Housecall, features a chilling tale accented by excellent perfomances by Bingo O’Malley (Creepshow) and Maryanne Nagel (Welcome to Collinwood). For more information on Chill Factor click here. 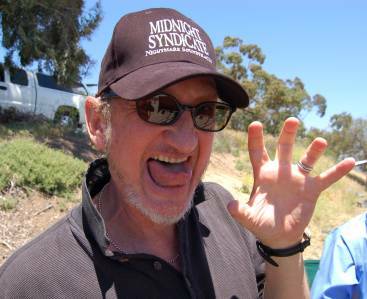 Midnight Syndicate has inked a deal with Warner Brothers-based Snapkick Productions, Inc. to compose the music for the upcoming feature film, Sin-jin Smyth – a story about two federal marshals transporting a prisoner who turns out to be the devil. “Sin-jin Smyth is an excellent story with a sinister backdrop that we’re looking forward to scoring to,” said Edward Douglas of Midnight Syndicate. “Additionally, we’re happy to be working with the top-notch creative team Snapkick has assembled.” Production is set for early June. With much more information to follow, be sure to check back and/or join the official Midnight Syndicate Legions of the Night mailing list for updates. Featuring a new logo designed by Brainstorm Studios, the t-shirt is currently available at the Entity Productions Merchandise Store. Edward and Gavin have begun writing for the next Midnight Syndicate disc. Scheduled for release in early 2005, the new CD will mark a return to their trademark horror stylings. “It’s going to be a very dark disc, ” said Edward Douglas, “with a real focus on the more sinister side of things that go bump in the night. In particular, the Cthulu mythos has been a good source of inspiration thus far.” Although details are forthcoming, Douglas says that the disc’s story will revolve around a turn-of-the-century house with a dark history… The band will once again call upon Keith Parkinson for artwork. “Keith really captured the essence of what we were going for in Vampyre so we’re really happy to be working with him again. We have a lot of plans for the visual element of this project. A couple of surprises we’re looking forward to sharing with fans.” The new disc may not be the only thing Midnight Syndicate will be working on in 2004. Plans for a very big project are in the works. Be sure to check back for updates or join the official Midnight Syndicate mailing list to be kept informed via email. Designed for Playstation 2 and X-box, the game features the track Relic Uncovered from the new Dungeons & Dragons CD. Baldur’s Gate: Dark Alliance 2 is now available in stores. First round of Dungeons & Dragons reviews and two new interviews with Edward Douglas and Gavin Goszka posted under Reviews in The Music section. Photos from the D&D CD Release Party now available in the Photos section. The listing appears in the November 2003 issue. 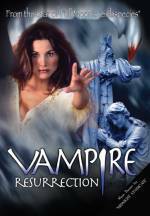 Subspecies star, Denise Duff’s directorial debut, Vampire Resurrection is now available at Blockbuster, Hollywood Video, and Suncoast and features Midnight Syndicate’s Noctem Aeturnus from Realm of Shadows as well as some tracks from Born of the Night. The heavily featured Noctem Aeturnus is used in an opening title graveyard montage which Ed Douglas says “is close to the perfect visual representation of what that track is for me.” Over the Halloween season, music from Born of the Night was also featured on the The Ellen Degeneres Show‘s October 31st haunted house episode. Look for Midnight Syndicate tracks from the new Dungeons & Dragons disc to appear in Interplay’s Baldur’s Gate : Dark Alliance 2 for X-box and Playstation 2 and the new Shadowbane: The Rise of Chaos expansion by Ubisoft. On October 4th, the Phantasy Concert Club will host the official CD Release / Listening Party for Midnight Syndicate’s Dungeons & Dragons CD. Doors open at 8pm with door prizes going to the first 30 guests dressed in gothic, medieval, or fantasy-themed costuming. 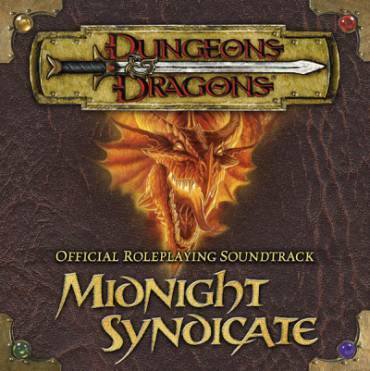 Other giveaways scheduled until 11pm include limited-edition Midnight Syndicate remix CDs and Dungeons & Dragons products courtesy of Wizards of the Coast. Edward Douglas and Gavin Goszka of Midnight Syndicate will be on hand to meet with guests. The new CD will be played throughout the night to complement various dark vendors and entertainers. Live music will commence at 9pm with Pittsburgh’s goth-rock act, Lazy Lane. Also playing are the Cleveland-based horror-metal group the Manimals acclaimed industrial act, UV, and the dancing troupe, Pharaoh’s Daughters. Admission is $6 for this all ages show and includes free admission to The Chamber for guests over 21. The Phantasy Concert Club is located at 11802 Detroit Ave. in Lakewood, Ohio (216-228-6300). Vendor tables are very reasonably priced. If are interested in being a vendor, please contact Roger Ganley. More details to follow. To see pictures from the Vampyre CD Listening Party visit the PHOTOS section. Professional haunts that plan on using the music of Midnight Syndicate in their attractions this season can now register online. More information on the Haunted Attraction Registry, can be found at the Haunted Attractions section of the site. Featuring some of the band’s most advanced production and sound design to date, this disc offers existing fans some thematic variety along with all of the elements they’ve come to expect from a Midnight Syndicate release. The CD will soon be available at gaming stores worldwide, Hot Topic stores with music departments, and through most of the vendors listed on our Where to Buy page. Orders can also be placed directly through Entity Productions. Dungeons & Dragons CD release date set. Preview tracks available now! Listening Party date announced. Advance copies to be available at GenCon 2003. Advance copies of the CD will be available at GenCon. The Indianapolis-based gaming convention, runs from July 24th-27th. Both Edward Douglas and Gavin Goszka will be on-hand at the Midnight Syndicate Soundtracks booth (#1204) throughout the show to meet and greet fans. The CD Listening Party is currently being planned for October 4th at the Phantasy Concert Club in Cleveland, Ohio (11802 Detroit Ave., Lakewood, OH, 216.228.6300). More information to follow. To see pictures from the Vampyre CD Listening Party visit the PHOTOS section. Second round of Vampyre reviews posted under Reviews in the CD section of the Midnight Syndicate shop. Haunting Vampyre Symphonies, echoing from ancient crypts, call forth the horror, mystery, and passion of the night. Join the all-new Midnight Syndicate discussion and info group and unleash your darkest nightmares as you enter the world of the Vampyre. . .
An interview with Midnight Syndicate’s Edward Douglas and Count Gore De Vol is available at The Creature Feature weekly web program now through Friday, October 19th. Many thanks to our fans and supporters who came out to the CD Release / Listening Party on the 7th. Many thanks as well to the talented design team at Screamline Studios, the tremendous cast, Fear The Dawn Lighting, Lazy Lane, and State of Being. Photos will be online soon. Additionally the first round of reviews for Vampyre are in and will be posted soon. On Saturday, September 7th, Midnight Syndicate is combining forces with Screamline Studios, Fear the Dawn Lighting, and a collection of some of the finest haunted attraction actors in the region to transform the Phantasy Concert Club into the ancient graveyard setting of their new CD, Vampyre: Symphonies from the Crypt. “It’s all about creating the perfect listening environment for the new disc. We’ve also thrown in a few surprises to make this even better than the release party for Gates of Delirium, says Edward Douglas. Doors open at 9pm with giveaways to the first 30 victims. Other giveaways to follow until 10pm. At 10pm the new CD will be unveiled. Live music will commence at 11pm with Cleveland’s State of Being (industrial-rock) and Pittsburgh’s Lazy Lane (psychadelic-horror/rock). All ages. Admission is $5. The Phantasy Concert Club is located at 11802 Detroit Ave., Lakewood, OH, (216)228-6300. Set in the catacombs of an ancient graveyard, the new Midnight Syndicate disc blends the horror, beauty, and mystery of the vampire in a gothic-drenched nightmare soundscape of the darkest proportions. The CD is available at Hot Topic stores (with music departments) as well as at many other locations. For more details, or to order directly through Entity Productions, visit the WHERE TO BUY section. European fans can now purchase Midnight Syndicate CDs online through the UK’s Darkcell Digital Music. 7 / 26 / 02 – Two tracks from the new disc now available on mp3.com! CD Listening Party announced for September 7th. 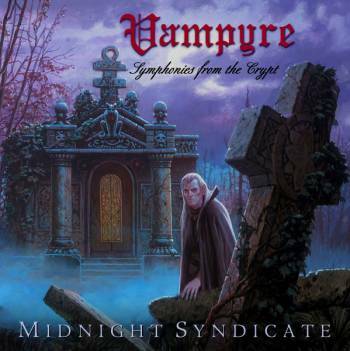 On August 13th, Midnight Syndicate will release it’s fifth CD, Vampyre: Symphonies from the Crypt. Two tracks are currently available to preview at http://www.mp3.com/midnightsyndicate. On September 7th there will be a CD Listening Party at the Phantasy Concert Club in Cleveland, Ohio (11802 Detroit Ave. • Lakewood, OH • 216.228.6300). Scheduled to perform that night are Cleveland’s State of Being and Pittsburgh’s Lazy Lane. Produced in coordination with Screamline Studios. More information to follow. To see pictures from the Gates of Delirium CD Listening Party visit the PHOTOS section. 5 / 20 / 02 – Updated convention schedule announced. 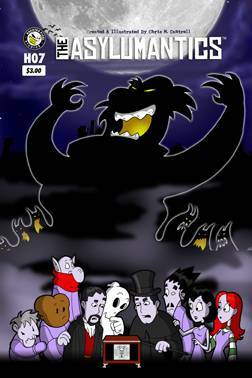 4 / 2 / 02 – Midnight Syndicate featured in Full Moon Picture’s Dead and Rotting. Director David Barton’s latest film features music from Midnight Syndicate’s Realm of Shadows in its opening titles. Dead and Rotting is currently available at Blockbuster’s nationwide. 3 / 19 / 02 – Midnight Syndicate garners raves from the gaming community. The band’s three most recent releases received excellent reviews in both November’s issue of Games Unplugged Magazine (http://www.gamesunplugged.com) and the Gaming Report (http://www.gamingreport.com). 3 / 1 / 02 – Midnight Syndicate honored locally. For the second year in a row, Midnight Syndicate took home the award for Best Gothic/Industrial Act at the Cleveland Free Times Music Awards. This follows the band’s sweep of the local awards in 2001. Many, many thanks to our fans in Northeastern Ohio who voted! 2 / 28 / 02 – Featured in Underground Entertainment Magazine. Issue #17 features an interview with Edward Douglas. 2 / 11 / 02 – Keith Parkinson to do artwork for upcoming release. World-renowned fantasy artist Keith Parkinson will be joining up with Midnight Syndicate to illustrate the cover for the group’s next release (August, 2002). A personal favorite of the band, Keith’s work includes illustrations for Dungeons & Dragons, the novels of Terry Brooks, and Sony’s Everquest (see picture to right). For more information on Keith and to see his work, stop by http://www.keithparkinson.com. 1 / 22 / 02 – Work on new Midnight Syndicate CD continues. Writing for the group’s fifth CD has been underway since November. The CD, which looks to be a return to the more traditional gothic stylings of Born of the Night and Realm of Shadows, has a strong vampiric theme to it. More details to follow. 11 / 2 / 01 – Midnight Syndicate dominates MP3.com. During the 2001 Halloween weekend, all six of the band’s mp3 singles were in the Top 20 for all of MP3.com (#1, #2, #7, #10, #12, and #19) registering over 100,000 listens in three days. The title track from Born of the Night remained at #1 for over a week with two tracks from Gates of Delirium (Gates of Delirium, and Alternative Therapy) maintaining their positions in the Top 40 as well. 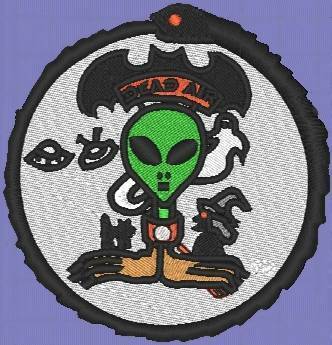 9 / 24 / 01 – Midnight Syndicate featured in Full Moon’s Witchouse 3. 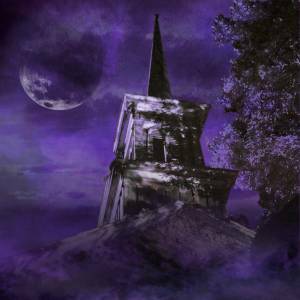 Full Moon Picture’s third installment of the Witchouse series features music from Midnight Syndicate’s three most recent albums. Directed and produced by Tempe Video’s J.R. Bookwalter, the film will be available in videostores nationally on October 14. 9 / 9 / 01 – Midnight Syndicate wins Best Sound Design / Music at NYC’s Spotlight On Theatre Awards. On September 9th, New York City held it’s 2000-2001 Spotlight On Theatrical Awards Show at the Jan Hus Playhouse. Midnight Syndicate received the award for Best Technical Achievement – Sound Design / Music for their involvement in the play, The Callback. Director Robert Boston Jr., who utilized Midnight Syndicate’s music for the play’s soundtrack was on hand to receive the award. The band would also like to congratulate Frank Calo and Robert Boston Jr. for The Callback’s additional awards in the areas of lighting and set design. 8 / 28 / 01 – Midnight Syndicate featured in European magazines Darklife and Judas Kiss. The Summer 2001 issue of Darklife (Germany) includes a review of Gates of Delirium as well as an interview with Edward Douglas. Judas Kiss’ Issue #7 (UK) features reviews of all three albums in addition to an interview with Gavin Goszka. Both magazine reviews have been added to the Gates of Delirium Reviews Section along with one from Haunted Attraction Magazine. 8 / 27 / 01 – Midnight Syndicate featured in Canada’s Unrestrained Magazine. The 4th Anniversary issue (#16) features an interview with Edward Douglas. 7 / 16 / 01 – Interview with Gavin Goszka by Federico Marongiu of Music Extreme. 7 / 14 / 01 – Midnight Syndicate featured in Rue Morgue Magazine. Issue #22 (July/August 2001) is currently available and features an interview with the band. 6 / 22 / 01 – Midnight Syndicate honored locally – sweeps 2001 Cleveland music awards. 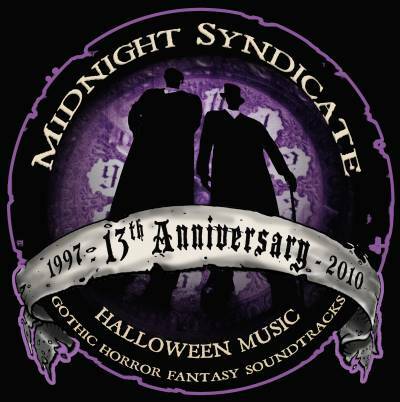 On June 21, Midnight Syndicate took home the award for Best Gothic Act at the 2001 Cleveland Scene Music Awards (www.clevescene.com). This follows up the 2001 Cleveland Free Times Music Awards (www.freetimes.com), in March, where they won the title of Best Gothic Act as well. Recently, they were also named one of the three Best Cleveland Bands in Cleveland.com’s Best of 2000 (www.cleveland.com).